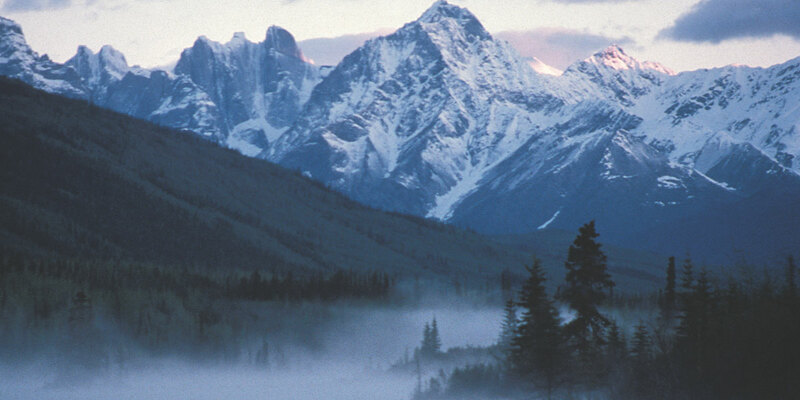 The ancient Dene lived in a dangerous and unpredictable world. Their land, Denendeh, was filled with giant animals who preyed upon people. Animals and humans could shift form and people often lived in fear. During this period, a powerful man named Yamǫ́rıa appeared in Denendeh. He journeyed throughout the territory in order to help the people. Yamǫ́rıa destroyed the giant animals and separated people from animals, establishing a relationship based on mutual respect and understanding. He gave the people laws to enable them to live together in harmony. Yamǫ́rıa is remembered throughout Denendeh as the great traveller and lawmaker. 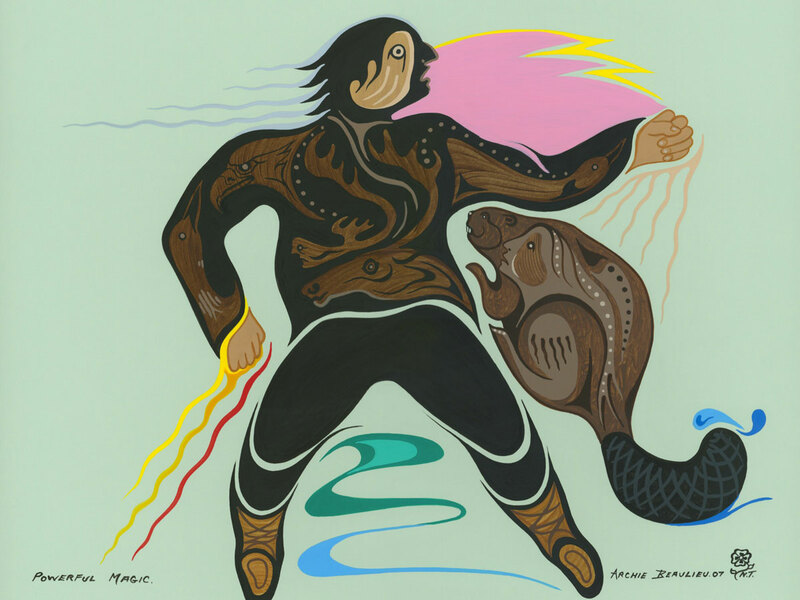 All Dene groups recount stories of this legendary man, whose name translates as The One Who Travels. 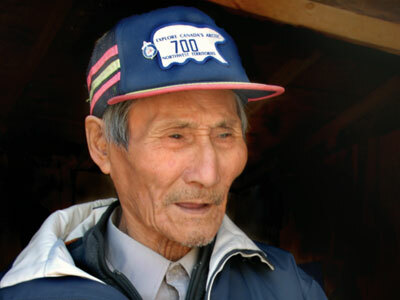 He is most commonly known by his Sahtu name Yamǫ́rıa, but each Dene language has a different name for him. Read biographies of some of Denendeh's cherished Elders. 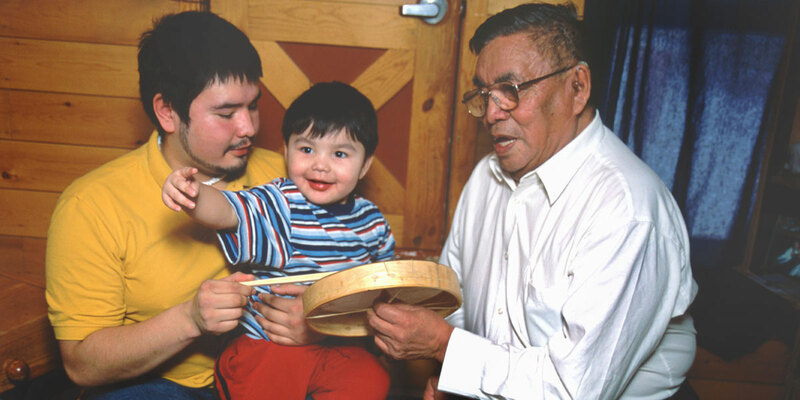 Listen to recorded stories told by Dene Elders. Read legends in each of the NWT's Dene languages. 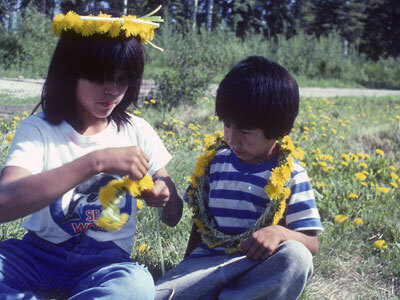 Reflect on a selection of Dene Laws that guide the Dene world view. Browse the many locations associated with Yamǫ́rıa throughout the Northwest Territories and beyond. Many people over many years contributed to this exhibition. 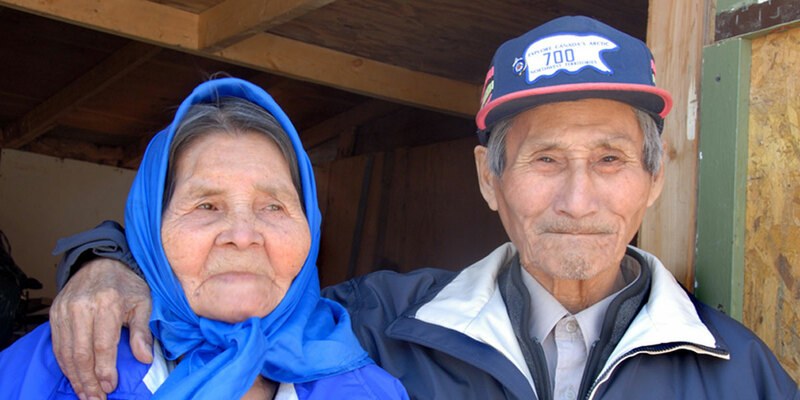 Elders have long held a revered place in Dene society. 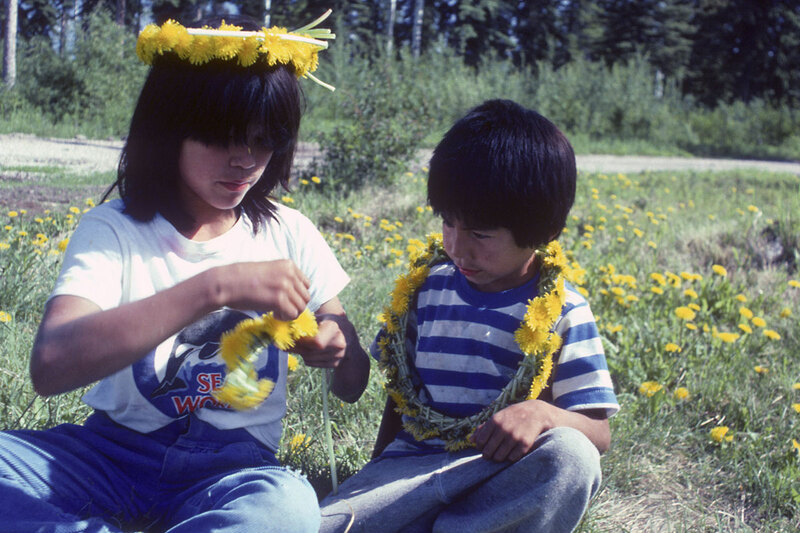 As carriers of cultural knowledge, they have long ensured that future generations of Dene youth would have the skills and grounding to survive and thrive in the challenging climate and terrain of Denendeh. 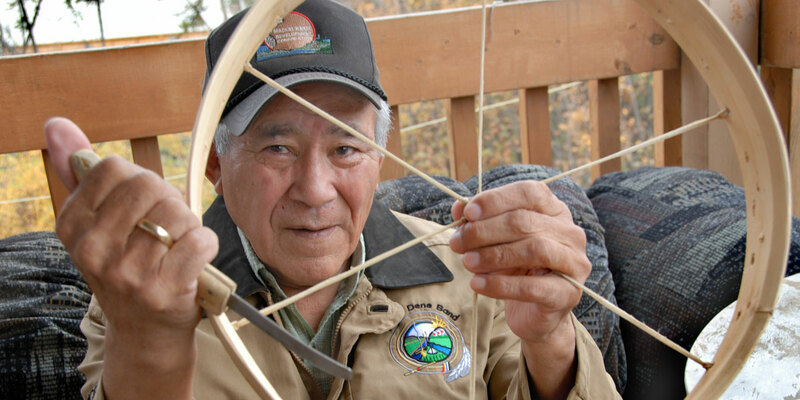 Below can be found only a sampling of the rich personalities who have enriched Dene tradition. George Blondin was a prolific storyteller and writer who dedicated many years to writing traditional stories. Born in 1923 in Délı̨ne, Blondin worked as a wilderness guide, a miner, a trapper and a journalist. He served as Vice President of the Dene Nation and Chairman of the Denendeh Elder’s Council. He was the author of several books including, When the World was New (1990), Yamoria the Lawmaker (1997) and Trail of the Spirit: Mysteries of the Medicine Power Revealed (2006). George Blondin was made a member of the Order of Canada in 2003. George Blondin la láyahnǝ gogodı́ ghǫ denehégode ghǫ bonıyǫ hagú gózǝ dene godı détl’e dáreht’e xaı gots’é gok’e w’ıla ɂeghálayı̨́da. 1923 ɂekúh xaı yá Délı̨ne begǫhlı̨, Blondin haı deshı̨tá dene k’ı̨́nadǝlǝ goghálayı̨da, nehká sǫ́mbafǝ hı̨ka neduɂekedı́lǝ goghálayı́da hé ɂehdz’o ɂeyı̨hɂı̨ hé godı ɂedı̨htl’é gha godı shı̨yelǝ w’ıla goghálayı̨da. 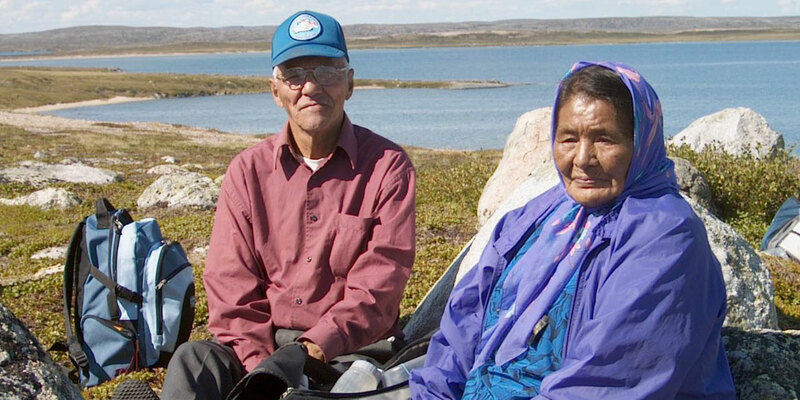 Dene Nation gogha Vice President yı́le hé Denendeh Elder’s Council gogha w’ıla Chaırmann hı̨lı̨. Ɂedétl’e sǫ́ɂareht’e w’ıla dǝyı̨tl’e, hederı ke When the World was New (1990), Yamoria the Lawmaker (1997) and Trail of the Spirit: Mysteries of the Medicine Power Revealed (2006). George Blondin haı ɂeyı Order of Canada ɂeyı 2003 ɂekúh xaı begháhęt’ǫ. Hı̨dú ɂets’édı horénǫ ts’éɂǫ́né begháı́ hı̨lı̨ kólı́ k’ále hı̨t’ı̨ godı détl’e hé dene hégode. Hederı godı la Denewáke kugodé yá ɂahęt’e. Menı godene hı̨sháke déhyǝ́ dene hégokede nı́dé k’ále legotsede kek’égodı gha. Harry Simpson was raised on the land, hunting, fishing and trapping. He served in many leadership positions in his community of Gamètì and was an elder advisor for the Tłı̨chǫ land claim and self-government agreement. As a child Harry listened carefully to elder’s stories. 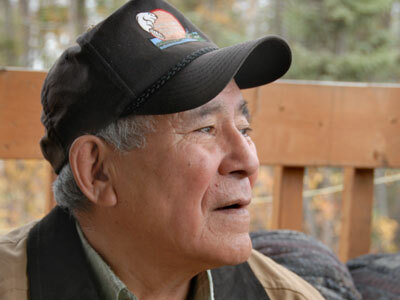 When he grew to be an elder, he worked hard to pass on his stories and traditional knowledge. 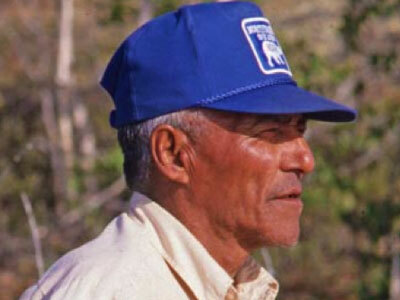 Harry led youth on many canoe trips following ancestral Tłı̨chǫ trails, telling stories at special sites along the way. Harry Simpson was a man who shared stories to bridge generations, cultures and to bring forth a new vision for the future of his people. Harry Sımpson dechı̨ta deèzhǫ, nàzè, łıwe k’alawo eyıts’ǫ edzoò k’ele ı̨̀le. Wekǫ̀ta gha ası̀ı łǫ k’e wheda ı̨lè eyıts’ǫ Tłı̨chǫ gha ndè ghǫ neyàetı eyıts’ǫ whacho ndèts’ǫ̀ k’aòwo gı̨lı̨ gha ǫhdaà dehkw’e sıı xè ɂaı̀t’ı̨ ı̨̀le. Harry Chekoa elı̨ hò, ǫhdaà whaèdǫ gondı t’à gogende nındè nezı̨ ehkw’ǫ ı̨̀le. Ǫhdaà elı̨ ajà hò, whaèdǫ gondı t’à done xè godo ajà eyıts’ǫ done naòwo t’à done ts’ǫ̀ gode. Harry Tłı̨chǫ gıts’ǫ etǫ k’è chekoa goxè elà t’à whaèdǫ tı̨lı̨ goxè ɂaet’ı̨. Etǫ k’e k’egede hò, wegondı gohłı̨ weghǫ Chekoa xè gode. Harry Sımpson ats’ǫ whaèdǫ gondı t’à ełets’ehkw’ǫ ha nı̨wǫ t’à whaèdǫ gondı t’à eyıts’ǫ done naòwo t’à chekoa xè gode wet’à ı̨da gogha weòt’ı̨ gıxè nezı̨ hoòɂǫ ha nı̨wǫ t’à whaèdǫ gondı t’à chekoa xè godo. Dıı ı̨ła hotı goxè hoòɂǫ xè ǫhdaà goxè egenda t’ıı̀, ekoòt’ıı̀ chekoa whaèdǫ gondı hoghàgets’ehtǫ dè nezı̨ą. Mary Kendi was born at the Pokiak Channel near Aklavik in 1915. She spent her early years living on the land with her family on the Pokiak Channel, at the Mouth of the Peel Village and in Fort MacPherson. At the age of six, Mary was sent by steamboat to boarding school in Hay River. Three years later, her uncle came to Hay River to bring her home. Upon returning home, she relearned her language and how to live on the land. In 1932 Mary was married to Alfred Kendi in an arranged marriage. The mother of nine children, Mary has maintained an active interest in storytelling and teaching traditional knowledge and culture throughout her life. 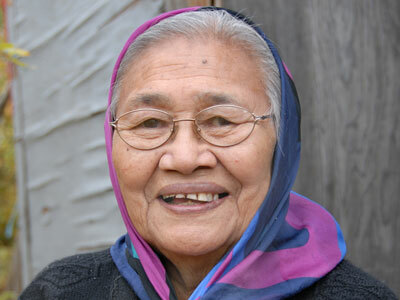 Mary was a founding board member of the Gwich’in Social and Cultural Institute. 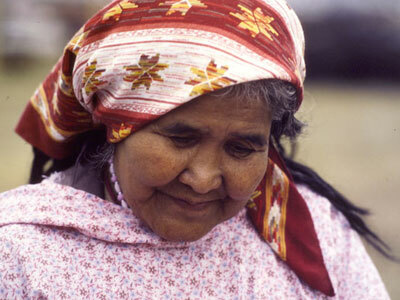 In 1992, Mary was one of the first women to receive the Wise Women Award, granted by the NWT Status of Women Council. 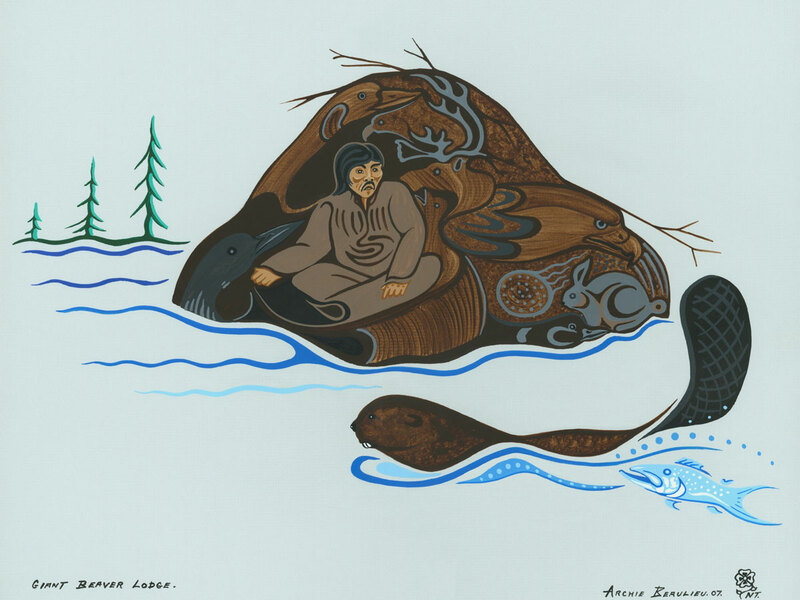 The biography of Mary Kendi is adapted from the Gwich’in Social and Cultural Institute (GSCI) 2001 Gwich’in Elder’s Calendar. Mary Kendi zrit 1915 dài’ Aklavik nduh ts’aii Pokiak Channel gwà’àn vagòonlih. Ezhik danh gwà’àn dizhehk’oo kat hàh diik’àyąhthat, gehkhee ts’àt Nagwichootshik danh gwà’àn chan ts’àt Teetł’it Zheh gwà’àn. Vaghàii nihk’iitik guuzhik, yi’eenjı̀’ Tr’ih Choo nahdalak k’ı̀ighe’ Hay River danh gàgootr’oonahtan gwizhı̀t nı̀tr’ı̀nyąhchih. 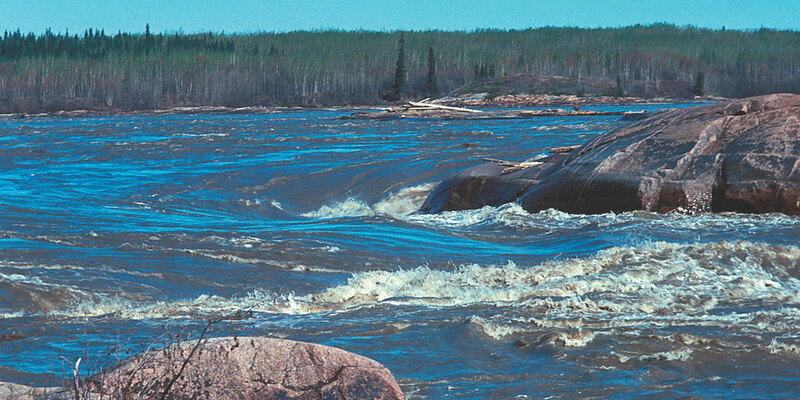 Khaii tik tł’ee, doo’ii nagogwiniinlii geenjit Hay River gwats’àt chùuzhii. K’anagahdadal tł’ee, digiginjik ts’àt nits’òots’àt dachantat gogwandaii gihk’anàgaanjik. 1932 hee gwànoo, Alfred Kendi gisrı̀inaginii’oo k’ı̀ighe’ nihkhatr’agwahnjik. Tr’iinin vanchòh nàk’oh zhàk dhı̀tinh eedi’i’, shı̀k gwandak agwaandak, dagwandaii dachantat ahdandaii gihk’yaanjik. 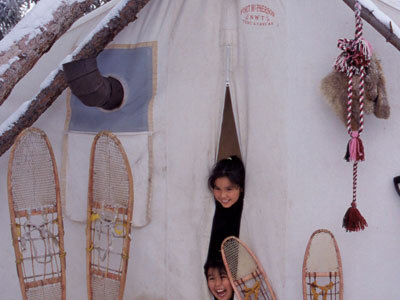 Gwich’in Social and Cultural Institute geenjit tr’oochı̀t gwijàa dhidlit. 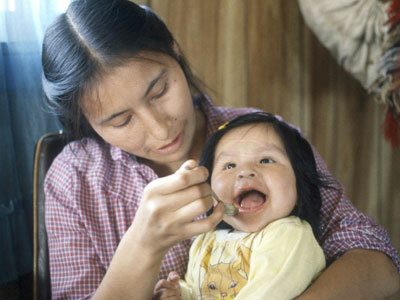 1992 hee gwànoo, aii oozhii NWT Status of Women Council giiyàhnuu gwats’at t’at gaayii ałtsaii, Tr’ı̀injòo Gwiinzheii Go’òozhii giitr’àhnuu. Jidı̀i nan gòo nin eenjit àhgwidandaii diitr’iinin kat ts’àt gagoovoonahtan łòo oozhii nizii goots’an gwaatsii gwik’ı̀t gòo’aih. If we remember the teachings of the legends and live them, if we take the sign set on the land for us as our symbol, we will never have any trouble surviving as a nation. The elders told us, there is knowledge in this story, find it and keep it. The story itself will not keep you alive but the lesson will help you survive. The stories will never die... We live our lives like the stories. When people tell you a story, that means they are teaching you something. When you listen you will hear something that you can use. Keep it, and then you can use it when you need it. 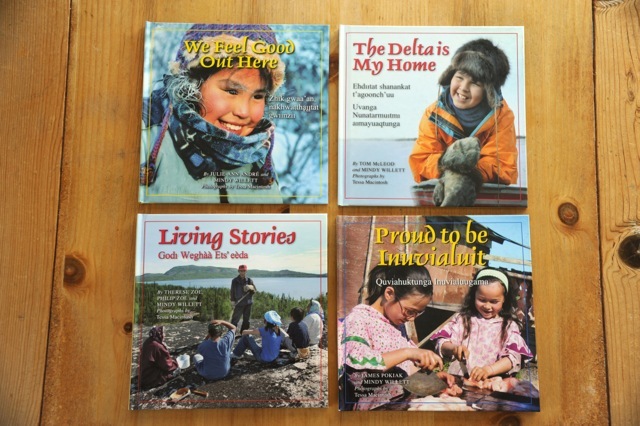 These stories belong to all of the Dene. 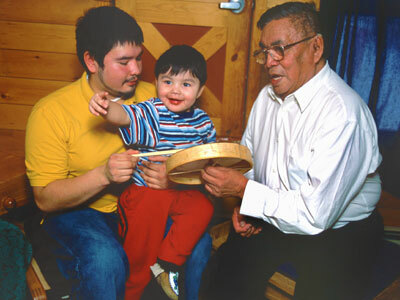 The elders who continue to tell stories continue our tradition of teaching. While we are still healthy and there are some elders among us, we should teach the children quickly using the words of the elders. I hope some day that the children will look at their ancestral life as part of life that they are living now. If they have two ways of life together their life would be good. 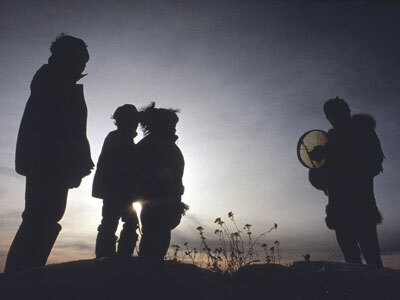 In the spring and summer of 2007, a team from CBC North set out to Behchokǫ̀ and Tulita to record elders telling Yamǫǫ̀zha and Yamǫ́rıa stories in Tłı̨chǫ and Sahtu. The most authoritative carriers of the Yamoria legends, the elders, are fast departing from us. 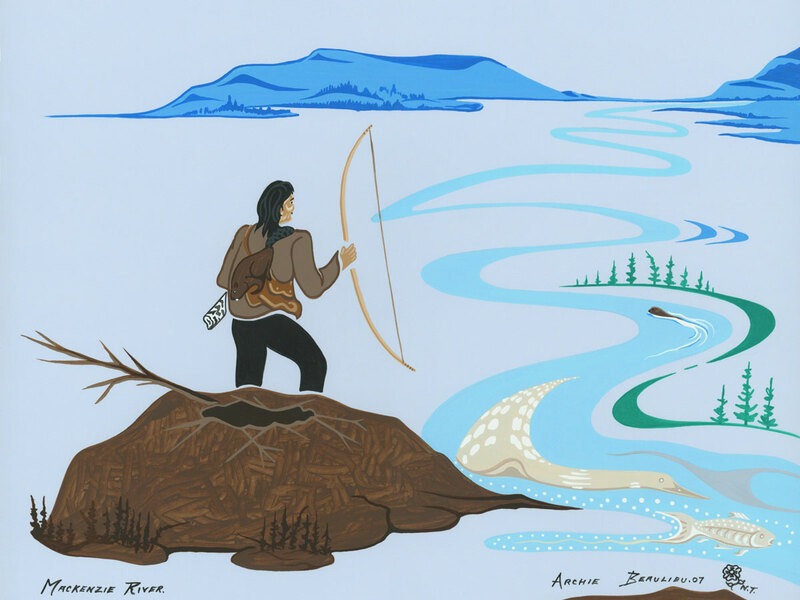 Because Dene language and mythology are so intimately linked, it was important that the stories be presented in the languages in which they have always been told. The Yamoria stories are so fundamental to the Dene we felt it was time to present them in an accessible manner to a broader audience. Listen to compelling soundscapes of Yamoria legends and learn more about our the storytellers. 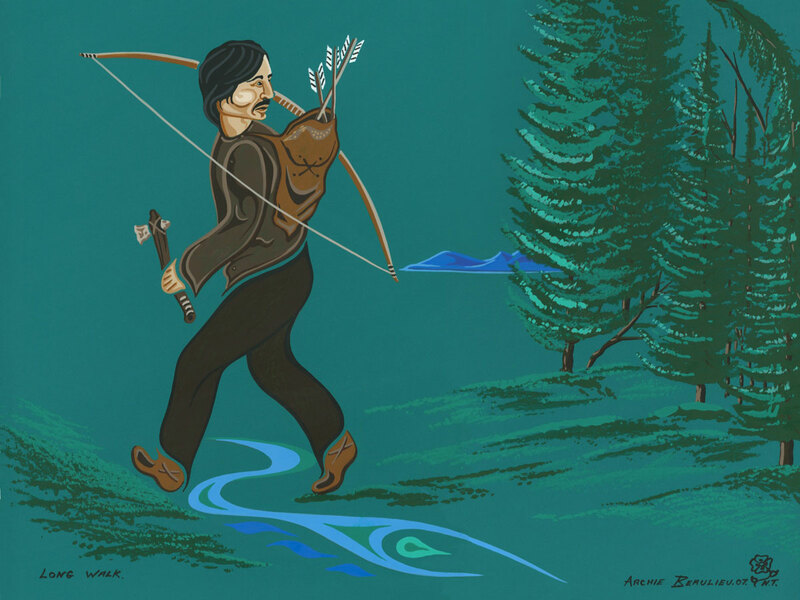 Born at Dull Axe Mountain (Olalo), Maurice Mendo grew up in the mountains near the Keele River, hunting and trapping with his family. Every fall, they would travel by moose skin boat to Tulita to trade and participate in community celebrations that included feasts, hand games, drum dances and tea dances. Ɂeyı Olalo gódedıyá begǫ́hlı̨, hagú Maurice Mendo ɂeyı Keele Rıver ɂeyı nı réyǫ,hagú ɂegúhyǝ́ dégot’ı̨néke hé ráyı̨zǝ hé ɂehdzo ɂayı̨hɂı̨. Xat’á toréht’e nı́dé ɂıts’éwé ɂelá hehsı̨hé Tulıt’a gots’é rakedet’ǫ yı̨lé ɂeyı yúkǫ́ę́ gots’é sáwé ɂǫ́nékedule gogha ɂakat’ı̨ hé gózǝ kǫ́ta shı̨rats’eyeda gogha lı́fądá kehsı̨ hé ɂudzı k’ekedéhw’ı hé ɂekǝlı̨ hé ɂı́lı̨wá hé w’ıla dakede. Julie Lennie was born near Kelly and Lennie Lakes, where she spent her childhood. 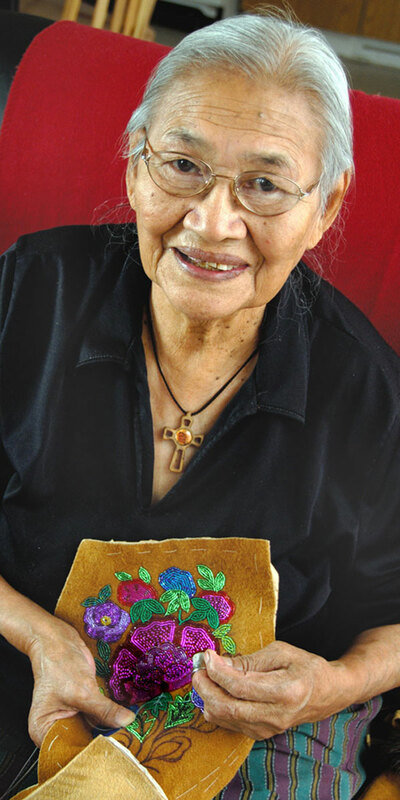 She worked hard as a child to learn to sew, embroider and bead under her mother’s instruction, and she is known for her high-quality beadwork today. 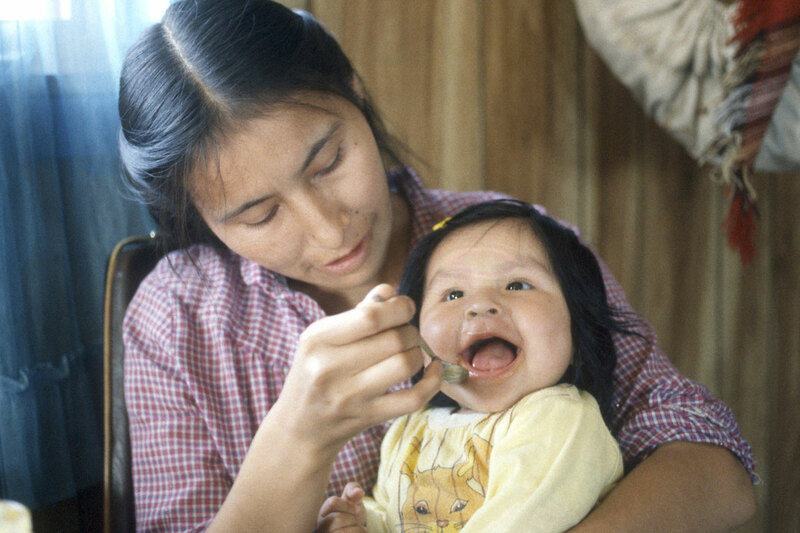 Julie learned to speak English while hospitalized for TB when she was young. She is now using her knowledge of both Sahtu and English to help compile a Sahtu dictionary. In 2007, Julie was honoured with an NWT Wise Woman Award. Julie Lennie haı Kelly hé Lennie Lake goghá nıwále yá begóhlı̨. Hagú ɂegúhyǝ́ w’ıla ts’ǫ́dane hı̨lı̨ hagúnı réyǫ. Hagú láhı̨sele ɂegúhyǝ́ benǫ ráɂerulu hé gózǝ lahsúwé hé ɂehts’oh hé ráɂerulu gha gayuréhtǫ hagú hı̨dúgawe gúnı ɂehts’oh hé ráɂerelu ghǫ bonıyǫ. Julie haı ɂek’óne hı̨lı̨ ɂegúhyǝ́ TB ɂayı́la hé dene ɂeyaı hı̨lı̨ kǫ́ę́ yı̨da nı gots’ę Mǫ́la xǝdǝ huwéhɂǫ hagú ɂaja. Hı̨dú dexǝdǝ́ hé Mǫ́la xǝdǝ́ honıhshǫ kexǫht’é hı̨dú dǝxǝdǝ́k’é gogha xǝdǝ dátl’e shı̨yǝlǝ ghálayeda hagú gots’ę bexǝdǝ́ hodúya gogha ɂedıhtl’é kuhsı̨ gogha denezǝ ɂegháalyeda. 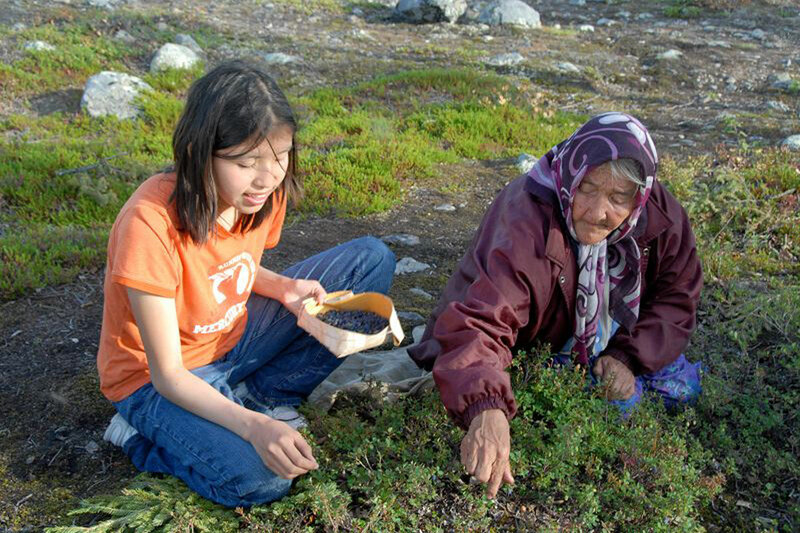 Ɂeyı 2007ɂekúhxaı Julie haı denets’é rádǝ gogha NWT Wise Woman Award begháhęt’ǫ. Paul Rabesca grew up in the bush, hunting, fishing and trapping with his family. 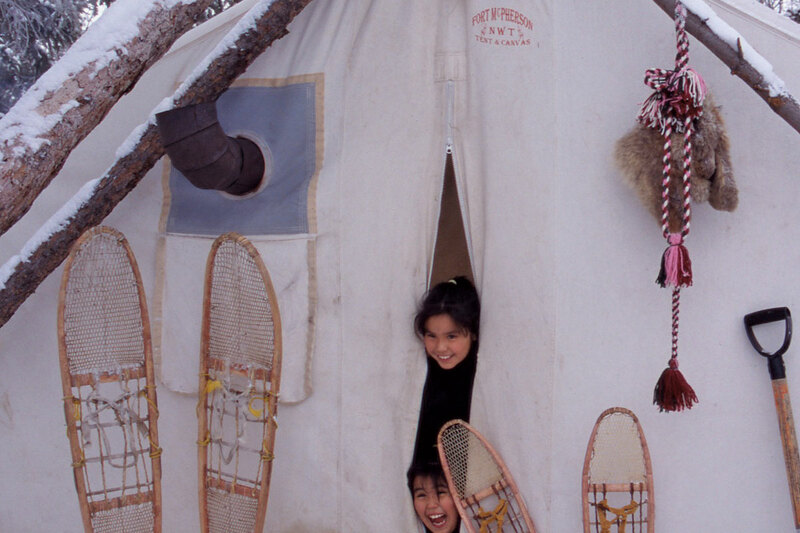 They travelled by birch bark canoe, wore caribou skin clothes and slept in a tipi. 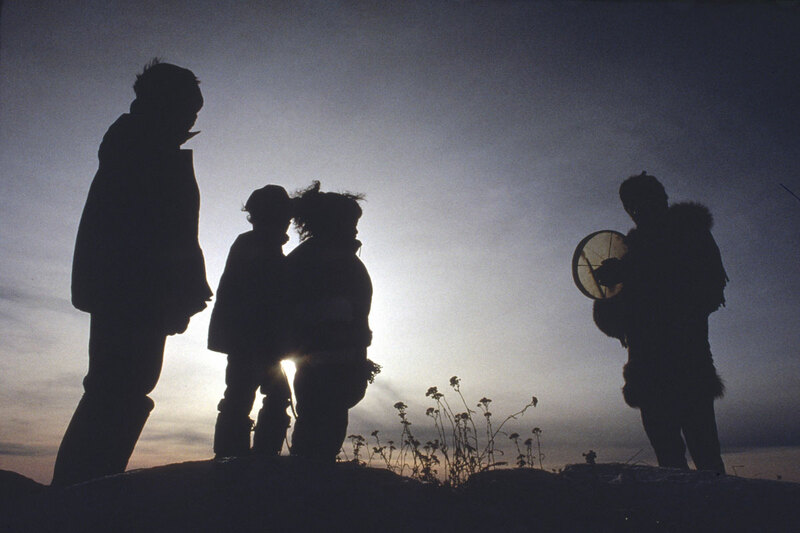 As a youth, Paul heard Yamǫǫ̀zhah stories from his father and other elders. Elders often told him stories after he fetched water for them. Paul Rabesca dechı̨tah deèzhǫ, weòt’ı̨ xè nàzè, łıwe k’alawò eyıts’ǫ ehdzoò nèle. Paul chekoa elı̨ hò k’ı elà t’àɂat’ı̨, ekwǫ̀wò ɂeh t’àɂat’ı̨ eyıts’ǫ whaèdǫ nǫhdaà yı̀ı̀ nàgete ı̨̀le. Deèzhe hò wetseè eyıts’ǫ ǫhdaa ats’ǫ Yamǫǫ̀zha wegondı t’à gogende ı̨̀le. Ǫhdaa gogha tsoh haanı-le dè ası̀ı gogha hayı̨̀la tł’àxǫǫ whaèdǫ gondı t’à gogende. This video is an excerpt from Wolverine, Devil of the North. It features George Blondin telling the legend of Yamǫ́rıa and the Wolverine. The animation is based on paintings by Archie Beaulieu. Produced in 2001 by Cogent/Benger Productions. 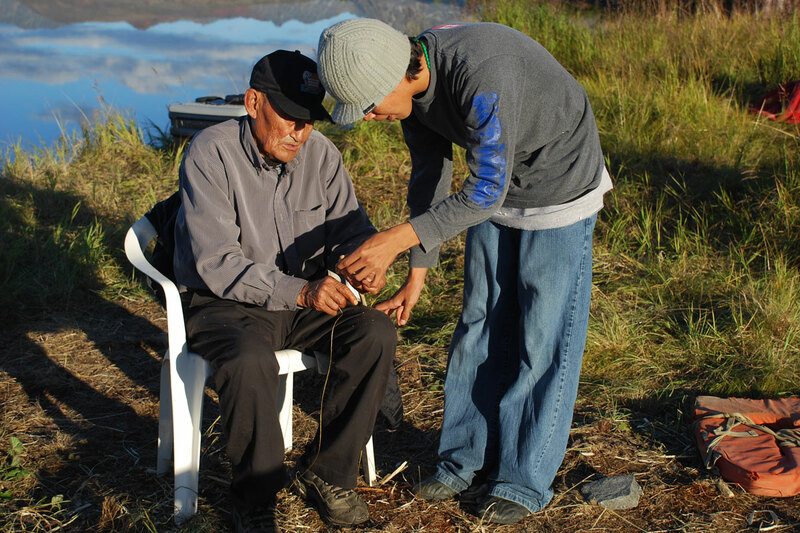 Throughout Dene history, elders have kept their traditions alive by telling stories to younger generations. Yamǫ́rıa stories recorded by travellers and missionaries in the 1800s are very similar to stories told in Dene communities today. 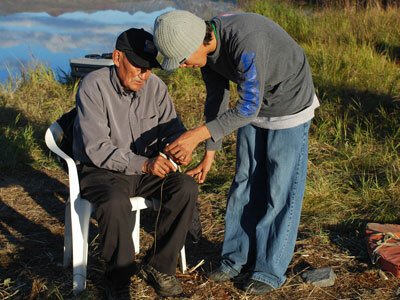 Many Dene elders feel it is important to record their stories so that they are preserved for the future generations. As with any oral tradition, there are many regional versions of Yamǫ́rıa stories. 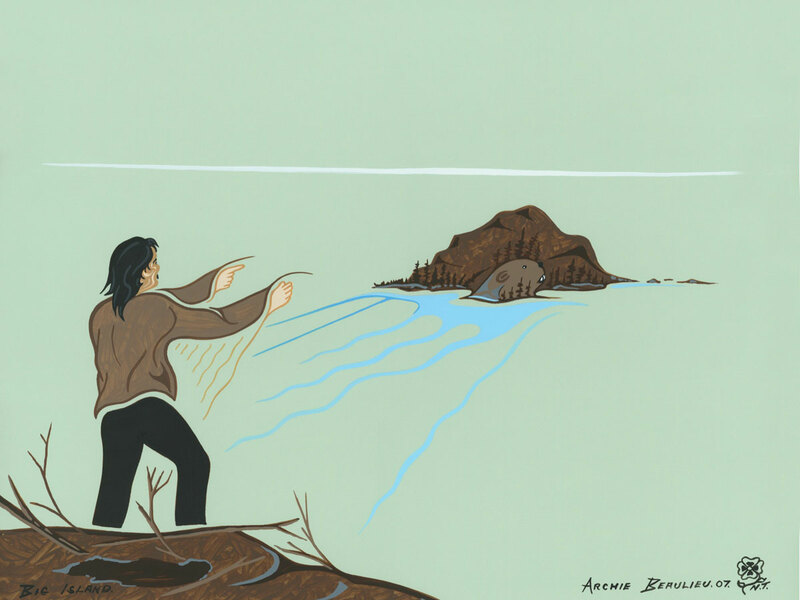 Every Dene group in the Northwest Territories tells the story of Yamǫ́rıa chasing giant beavers, but the details change according to language, region and individual storyteller. The six stories told below are only a few of the many versions of Yamǫ́rıa stories in an ancient, dynamic and fluid storytelling tradition that lives on today. Long ago, in the days when giants roamed the land, Atachùukąįį was a great Gwich’in leader. While traveling in the Yukon, Atachùukąįį met a man-eating giant named Ch’ii Choo. 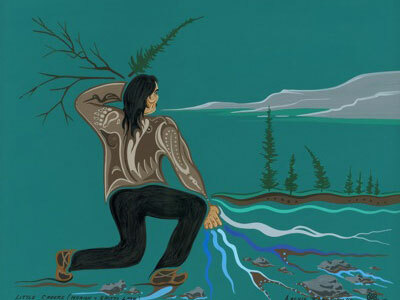 Ch’ii Choo began to chase Atachùukąįį but Atachùukąįį escaped by canoe, paddling along rivers towards the Northwest Territories. 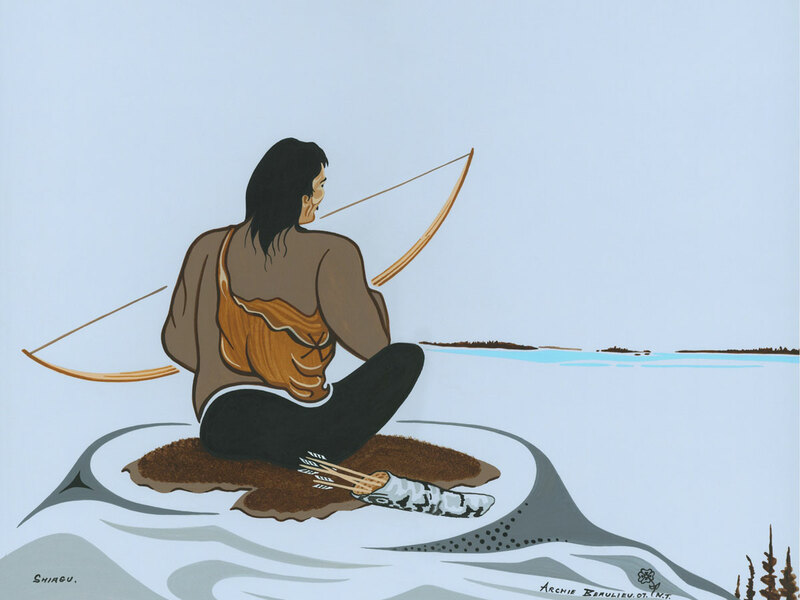 When Atachùukąįį reached the Ramparts on the Mackenzie River, he left his canoe behind. A large rock that looks like an overturned canoe can be seen there. Atachùukąįį sat down to rest, creating a place that is still indented. He couldn’t rest long because Ch’ii Choo was catching up, so he ran away along the shore. 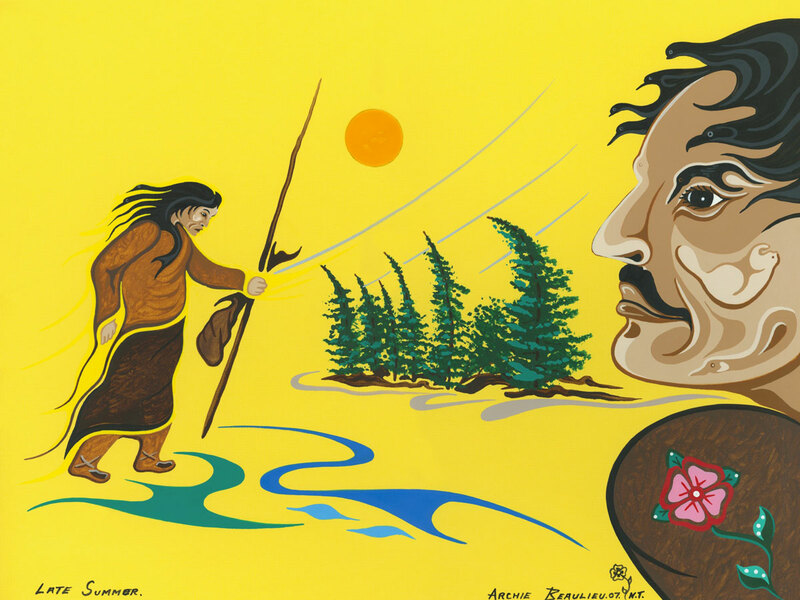 Ch’ii Choo followed and in six giant steps he created six big lakes between Fort Good Hope and Norman Wells along the Mackenzie River. Atachùukąįį knew he could not overpower Ch’ii Choo so he decided to outsmart him. Every time Ch’ii Choo killed something to eat, Atachùukąįį hid it while Ch’ii Choo was washing. This continued until Ch’ii Choo began to starve. He became so hungry that he cut off a piece of his own backside and made it into pemmican. Ch’ii Choo wanted to cool the pemmican so he asked a muskrat to bring it to a nearby creek with cold water. When the muskrat swam by, Atachùukąįį took a rock and hit the muskrat in the mouth. 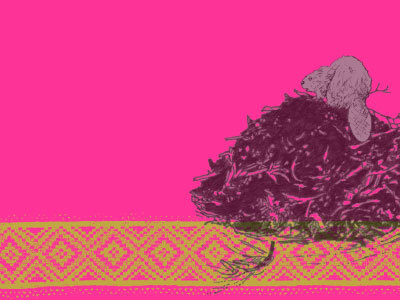 The rat dropped the pemmican and Atachùukąįį scooped it up with both hands and ate it. When the muskrat told Ch’ii Choo that he had lost the pemmican, Ch’ii Choo began to cry. He sang a sad song about how he would never see the sunrise or sunset again. Then he starved to death. Niinzhit dài’ gwànoo, aii dinjii nichee diitat nı̀dhı̀zhee dài’, Atachùukąįį zrit Dinjii Zhuh eenjit gwichı̀t nichee iinli’. Yee’ohts’aii nadindye dài’, Atachùukąįį zrit Ch’ii Choo yakàdadhizhee jùu ezhik dài’ dinjii ajaa iinli’. Ch’ii Choo Atachùukąįį yik’ı̀h chı̀lgik gwàt tr’ih tsal hàh yehłat chùuzhii han njı̀’ zhik ts’aii nakhwanankak ts’àt needakak. Atachùukąįį chuu niint’aii k’ı̀t gwats’àt k’adik dài’, ditr’ı̀i tsal ekhè’ yuunuh. Ezhik danh tth’aih jùk et’et ditr’ı̀i tsal łihts’ee dadhitinh. Atachùukąįį ihłèh nùudye ts’àt nijı̀n gwà’àn nùudye egwideech’in. Duuyeh niinzhit ezhik danh dhidye, Ch’ii Choo yik’ı̀h chilgik geenjit ı̀inch’its’àt uu’àn chùuzhee tęęvęę nji’. Ch’ii Choo yik’ı̀h chùuzhee ts’àt khanh danàa’yųų vik’ı̀ighe’ van nihk’iitik Chii Dą̀įį Zheh gęhnjı̀t gwinjik aii van egwideech’in Nagwichoonjik nji’. Atachùukąįį zrit aii Ch’ii Choo gàayįį yahtsii kwaa gàh’eedandai’ geenjit nàgwan’ee k’ı̀ighe’ akòo t’àheedi’yaa yuunuh. Ejù’ łǫ̀ǫ Ch’ii Choo shı̀h dhàłkhaih dài’, adik’a’ałtraa guuzhik Atachùukąįį zrit yin’įį ts’àt dizhii uu’àn yinagwineh’ı̀k akòo t’èedi’in’. Nihkhan akòo t’èedi’in’ guuzhik Ch’ii Choo khanh ts’àt datsan k’ı̀ighe’ vat’ą̀įį kwaa nagwijàatth’at. Shı̀h jùhłįį geenjit ditł’į̀į ts’ęįį ts’àt vatthą̀į’ iint’uh ts’àt gàh itsų̀h hàh ałtsąįh. Ch’ii Choo zrit aii itsų̀h nı̀idhaa nilii geenjit Dzan nı̀ink’oo yahtsii eenjit yuudahkat, yaa’àt srı̀it’ąhthee teetshik zhı̀t nı̀ink’ǫǫ yahtsii t’àheedi’yaa geenjit. 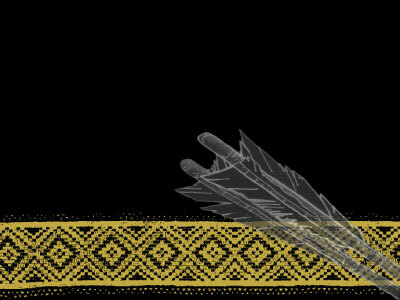 Atachùukąįį zrit guk’àt’iiniindhan geenjit aii Dzan yehgǫǫ k’adivik dą̀į’, chii tsal hàh yichı̀lnaii aii Dzan dizhı̀k yichı̀lnąįh. Dzan zrit itsų̀h nàdànalną̀įį aniindhòk Atachùukąįį dinlį̀’ hàh tthak gùunjik ts’àt ajaa. Dzan zrit Ch’ii Choo aii itsùh eenjit vatr’agwalndak yàhnuu, khanh ts’àt nathitreh. Sree ne’e’ak ts’àt gi’ta’ak chan natanah’yaa kwaa geenjit tr’igwidįį ilik hàh edlii. Aii tł’ee nehsrit t’at datsan k’ı̀ighe’ nàniindhat. Tsiigèhtshik danh gwàts’at Gabe Andre vagwandak vatr’òonjik. Long ago, a special man named Yamǫ́rıa traveled through the land, putting everything in its rightful place. 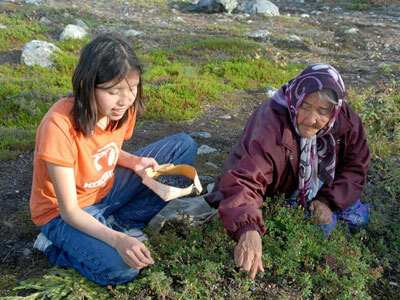 During his travels, Yamǫ́rıa met a young woman who lived by herself in the bush. She was cooking and offered Y Yamǫ́rıa some food. 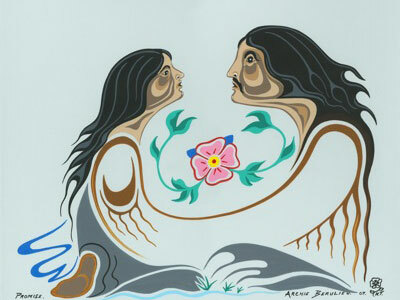 After Yamǫ́rıa ate, the woman suggested that they live together as a couple and Yamǫ́rıa agreed. She asked Yamǫ́rıa for one thing – to cut a willow and place it over running water before crossing it when he was out on the land. Yamǫ́rıa didn’t understand why she wanted this but he agreed to her request. They lived together happily for a long time. One day Yamǫ́rıa was out in the bush hunting. It was getting dark and he was in a hurry to get home. He came to a creek and decided not to place a willow across it. When he arrived home he found his wife was gone. Using his magical powers, he followed her and discovered that his wife was really a giant beaver. She was living with a family of giant beavers at a big lake near Whatì. 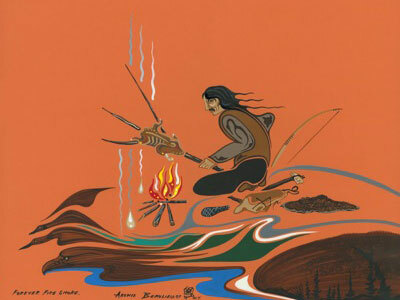 Her beaver family had been killing and eating Dene who traveled in the area. 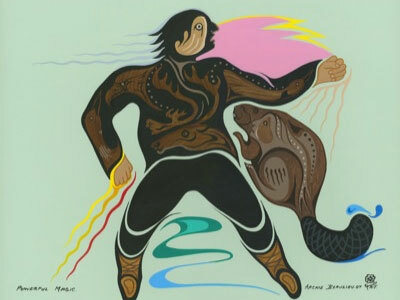 Yamǫ́rıa began to chase his beaver wife and her family. He chased them all the way through Great Slave Lake and down the Mackenzie River. He caught up with them at Great Bear Lake and chased them around the lake to Tulita. Yamǫ́rıa killed three giant beavers at Tulita, skinned them and stretched their hides on Great Bear Rock. You can still see the oval outline of the beaver pelts there today. Adapted from stories written by George Blondin, originally of Déı̨ne. Yáhnǝ gúnı dene sure yádárı́yǝ Yamǫ́rıa hédadı, denenéné ɂareyǫ́né gok’e denehé gonezó gówoɂa gogha gota k’ı̨́nayeda. Nehk’e radeda ɂegúhyǝ ts’ékuwe wanı deshı̨ta rágw’e ts’ékáyı̨ya hagú t’áhsı̨ heht’ǝ hé Yamǫ́rıa shénetı̨ héhdı̨. Yamǫ́rıa shéyetı̨ ɂeyıtl’ą ɂeyı ts’ékuwe súdúle ɂelehghá ráhı́hdǝ yéhdı hagú Yamǫ́rıa hęɂę yédǝyı̨dı. Hagú gok’éyı̨xa ts’ékuwe hederı Yamǫ́rıa hudǝyı̨kǝ-déhyǝ́ deshı̨ta k’ı̨́naneda nı́dé judenı nılı̨né k’énehta nédewǫła nı́dé féré k’áı́ lı́yefı̨ tuta nǝ́nıɂá rı́nıshu gha yédǝyı̨dı̨. Yerı kexǫht’e ɂadı du Yamǫ́rıa konıhshǫ yı́le kólı́ hęɂę yédǝyı̨dı. Ɂeyı gots’ę nıwá gots’é gonezó ɂelehghá ɂakeyı̨t’e. Haıyı̨lé láódet’é Yamǫ́rıa rázǝ k’ı̨nada ɂegúhyǝ́ɂede behé goderı́tl’e hé ɂáradúja gots’é forı yenı́wı hé judenı nılı̨né date nédúya yı̨́le ɂegúhyǝ́ ɂehdı̨né godatǝ k’áı́ duhfı́le yenı́wı hé dugáyédı. Ɂáranıya haıyı̨lé bets’ékuwe húle. Deɂets’éné hé yı̨ka yek’é gáyeyıda haıyı̨lé sádéwé hı̨lı̨ kodéhsha hagú gózǝ sádéwé kota Whatı̨ goghá nıwále tudéwék’e gózǝ begot’ı̨néke w’ıla sádéwé kı̨lı̨ gháɂahet’e lǫ. Ɂeyı sádéwéke yá déhyǝ́ ɂegúhyǝ́ goghá dene radéde nı́dé dene xakǝdǝ́dǝ yá ɂakeyı̨t’e. Yamǫ́rıa ɂeyı sádéwé bets’ékuwe hı̨lı̨ hé gózǝ sá hédéhfe. 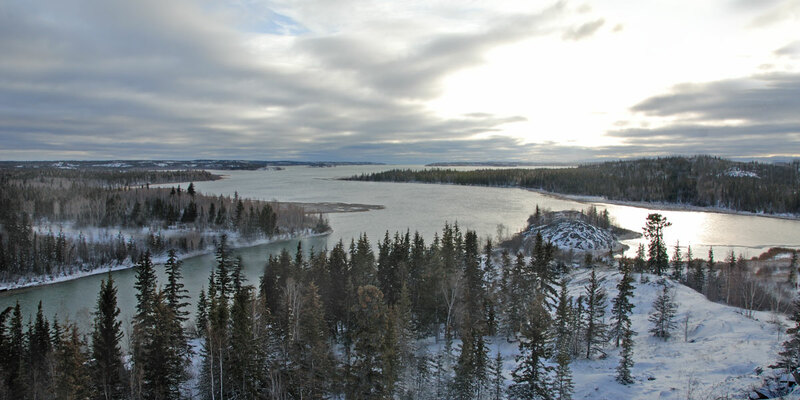 Ɂeyı Great Slave Lake gots’ę Dǝhogá ɂeyı Sahtú tuhok’é got’ánıya hagú ɂeyı tuho wına Tulıt’a gots’é goderéyu hagú ɂeyı nıyá Yamǫ́rıa sádéwé taı wehxı̨ hagú Kwetı̨nı̨ɂah ɂeyıyá sáwédéwé gok’erı́tonıhfe hagú hı̨dúh dzı̨ne gots’é k’ále keyagowę. Délı̨ne gots’ę George Blondın begodé ts’ę godı. Long ago, Zhamba Déja left his home at Rabbit Kettle above Virginia Falls. He walked and paddled throughout the land, killing giant animals and looking for people in trouble that he could help. Along his journey, he met an evil old couple and their daughter. The man asked Zhamba Déja to help make arrows. The evil man instructed Zhamba Déja to gather branches that grew hard and straight. While looking for branches, Zhamba Déja came upon a big pile of rocks. The rocks rose up to attack him. Zhamba Déja calmed the rocks and dispersed them to creeks and riverbeds, where you will find stones today. When Zhamba Déja returned with branches, the man was surprised to see him alive. Next, he sent Zhamba Déja to collect eagle feathers to serve as flights for arrows. Zhamba Déja approached a giant eagle nest with two baby eagles inside. The boy eagle told him his parents were out hunting. When the mother and father eagle returned carrying human flesh, Zhamba Déja killed them. He spared only the boy eagle who had helped him. Zhamba Déja made the baby eagle promise to eat fish and game instead of humans. He squeezed him so that he would never grow bigger and that is why there are no more giant eagles. Zhamba Déja returned to camp carrying eagle feathers. The old man was disappointed that Zhamba Déja was still alive. He said he needed sinew to bind the arrows and sent Zhamba Déja to a swamp where a giant monster lived. Zhamba Déja carefully approached the monster and shot it in the chest with three arrows, killing him. He cut out sinew from the monster’s back and brought it back to the man. Zhamba Déja had gathered branches, feathers and sinew. Using sharp arrowheads, he proudly made arrows out of these materials. 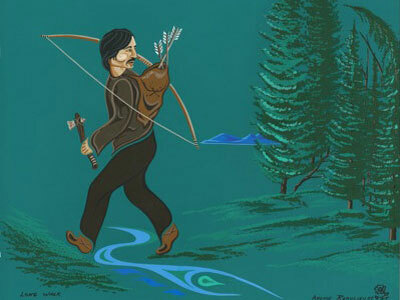 Adapted from a story told by Madeline Mouse to Robert G. Williamson on the Liard River. Atthe t’ǫ́h, Zhamba Déja dekǫ́ę́ Gah Eteneh ekǫ Náı̨lı̨cho godéh gots’ęh déhtł’ah. K’etleh gots’ęh elá t’áhchu aht’ı̨, kat’ı̨ lǫ́ǫ ekúh golǫa nechácho k’eɂáh ı̨lé łaadeh gots’ęh amı̨́ı̨ goxéh gonezų ı́le nıdé gots’ą́ąndı kat’ı̨. Gok’eadetł’e lǫ́ǫ gotsı́e gots’ęh gotsų kı́ dene nezų egıt’éh ı́le gots’ęh gotué goghǫétł’ah. Iı dene Zhamba Déja ką́hndı, sı̨ dúle ełets’ágendı t’áh k’ı̨́ gehtsı̨. Ezhı dene kı́ dene nezų ı́le Zhamba Déja kąhndı, ekǫ k’áchı̨nıa see ɂehtth’I zhádéɂa zǫh kánıt’a zhę́hndı. Zhamba Déja káchınıa káneta lǫ́ǫ́ the łǫ ełedáh zháhthéla ghǫetłah. Ezhı the Zhamba Déja ts’ę́ tthee aget’ı̨. Kó nezų gots’ę́ gondeh t’áh ts’ınıh agejá, ıı gotł’ą́ą dehgáh dee gots’ę́ godéhde, dúh gots’ę́ k’álah ejı thela. Zhamba Déja k’áchınıa nátthehtsı t’áh nı́anotł’ah, ıı dene kı́ nezų ı́le edáondı́ t’áh kı́ Zhamba Déja łanıdhe ı́le enıdhę t’áh zhech’áh dahdzeedatlłah. Ezhı gotł’ą́ą Zhamba Déja k’áhndı́ ehndaa t’á k’ı̨́ gha kánıtá zhę́hmdı. Zhamba Déja ehndaa met’ǫcho ghǫetłah mezhı̨́h ehndaa aets’élıe ǫkı geke. Ehndaa denelı̨a kadı, memǫ gots’ęh metá t’ahsı́ı nágezéh gots’ę́ łégedéhtthe ndı. Ezhı Ehndaa gomǫ gots’ęh gotáh nı́ełégı̨tthe, edáondı́ dene łagénıhthę gots’ęh gotthę́ nı́agénıla, ezhı gha Zhamba Déja łagónıhthe. Ehnda denelı̨a zǫh zhets’áı̨ndı́ t’áh kı́ dasázhı̨́lá ı́le. Zhamba Déja ezhı ehndaa denelı̨a káhndı, dúh gots’ę́h ndaa łué gots’ę́ golǫa tthę́ zǫh shénetı̨h zhę́hndı. See deghá ezhı ehndaa denelıa édéhtsı̨h, ezhı ts’ı̨hɂǫ́ dúh got’sę́ kı́ ehndaa nechá gháts’enda ı́le. Zhamba Déja ehndaa t’á nı́anıddhah. Ezhı ǫhndah Zhamba Déja k’álah gondı́h megha dzǫ́ǫt’e. Zhamba Déja káhndıh, k’ı̨́ gha tth’éh enı́ddhę ndı gots’ęh kodı̨ godéhro nánde gots’ę́ zhedéhɂa. Zhamba Déja ts’ıneh t’áh godéhro ghǫetłah gots’ęh k’ı̨́ t’áh taelı́ zhedzee ghaenıhgé ıt’áh łazhénıhtthe. Zhechı̨́tah gots’ęh ech’ı́dé káıtthé gots’ęh ǫhndah t’sę́ nadéhtł’ah. Zhamba Déja, k’áchınıa, ehndaa t’á gots’ęh tth’éh shu nátthetsı̨. Ezhı t’ahsı́ı kanéht’é náhtthetsı̨ t’áh k’ı̨́ déhtsı̨. Edı la Madeline Mouse, edı dene Robert G. Williamson gondı ghǫ zhégoınde ke’h ǫ́t’e. Long ago, in the days when dangerous giant animals roamed the land, a giant wolverine set up pointed stakes at the bottom of a big hill called Hodoòdzoo. When people slid down, the stakes pierced and killed them. Yamǫǫ̀zha traveled to Hodoòdzoo and he saw the wolverine’s stakes at the bottom of the hill. He slid down slowly and stopped before he reached the stakes. Then Yamǫǫ̀zha made his nose bleed and spread the blood on his caribou skin shirt. He placed the shirt over the stake to make it look as though he’d been pierced through the heart. When the wolverine came, he found Yamǫǫ̀zha lying still. Thinking he was dead, the wolverine placed him in his big birch bark basket and carried him home. When he got home, the wolverine’s family built a fire in their den. Yamǫǫ̀zha could see they were getting ready to cook him. The wolverine’s son saw that Yamǫǫ̀zha had one eye open. He told his father that Yamǫǫ̀zha was alive and looking at them. The wolverine didn’t believe him. The wolverine’s wife passed the wolverine his big stone knife to cut up Yamǫǫ̀zha. Seeing this, Yamǫǫ̀zha quickly reached into the fire and grabbed a burning log. He hit wolverine and his wife on the head and they fell over dead. The wolverine’s children ran outside and climbed up a nearby spruce tree. The son begged Yamǫǫ̀zha not to kill him. 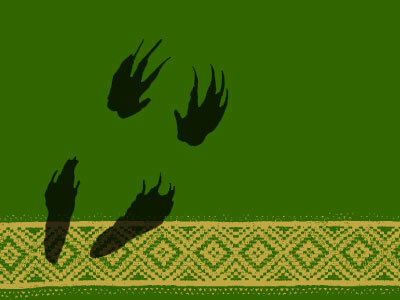 He promised not to eat people anymore and so Yamǫǫ̀zha beat only his feet, making them flat and wide like wolverines’ feet are today. This is how Yamǫǫ̀zha made Hodoòdzoo safe for the people again. To this day Tłı̨chǫ slide down Hodoòdzoo to predict their future. If they slide straight it is said they will live a long and healthy life. Adapted from a story told by Harry Simpson of Gamètì. Akwewhaà, tıch’aàdıı nechà wech’àhoèjı̨ dıı nèk’e nadè hò, nǫ̀ghacho dechı̨ goèch’oo shı̀h nechà wezhıı Hodoòdzoo wıı̀yeh, akǫ t’a done łahde ı̨̀le. Done hodoògedzoo nındè, eyıı̀ dechı̨ gıghakah t’à łagede ı̨̀le. Yamǫǫ̀zha Hodoòdzoo ts’ǫ̀etłah eyıts’ǫ nǫ̀gha wets’ǫ dechı̨ goèch’oo shıh wezhıı naı̨̀ɂa yaɂı̨. Ts’ehwhı̨̀ą ı̨zhıı̀ hodaàzoo eyıts’ǫ eyıı̀ dechı̨ goèch’oo naı̨̀ɂa kwe nıı̀tła. Eyıtł’àxǫǫ, Yamǫǫ̀zha wı̨ghǫǫ̀ edoò ayı̨̀la xè. Wedzeè ghaako laanı̀ wegaht’ı̨ ha wets’ǫ ekwǫ̀wò ɂeh k’e yeètsoh, dechı̨ k’e weɂeh dawhehchı ayı̨ı̨̀la. Nǫ̀gha nıı̀tła hò, Yamǫǫ̀zha ts’ehwhı̨̀ą whetı̨ deètsı̨. Łaı̨̀wo nı̨wǫ t’à, nǫ̀gha wets’ǫ k’ıtǫ necha yı̀ı̀ neyeèchı xè dekǫ̀ ts’ǫ̀ nayeègeh. Dekǫ̀ nıı̀tła hò, wèot’ı̨ gıkǫ̀ goyı̀ı kǫ̀ geèhtla. 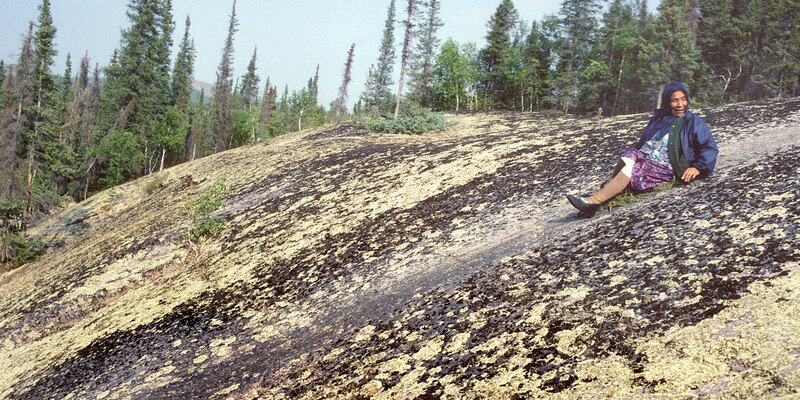 Hot’a Yamǫǫ̀zha geht’e ha ts’atà segogehɂı̨ goghàda. Nǫ̀gha wezha, Yamǫǫ̀zha wendaà ı̨łè t’à k’eèt’ı̨ yaaɂı̨. Wetà ts’ǫ̀ hadı, Yamǫǫ̀zha ı̨ła endaà xè goghàda dıh. Nǫ̀gha wegha ehkw’ı ahodı-le. Yamǫǫ̀zha tàyeet’à ha Nǫ̀gha wets’èke Nǫ̀gha wets’ǫ satsǫ̀ mbeh necha yeghàechı. Dıı yıghàda t’à, Yamǫǫ̀zha kǫ̀ dıı̀k’ǫ ts’ǫ tsoh dıı̀k’ǫ ı̨łè neyıı̀chı. Nǫ̀gha eyıts’ǫ wets’èke nàgoı̨̀xà t’à ełak’a hodàdegehwò t’à łagı̨̀deè. Nǫ̀gha wezha hazhǫ mǫht’aà ts’ǫ̀ tǫmoègede xè ts’ı k’e dekegı̨ı̨̀de. Nǫ̀gha wezha Yamǫǫ̀zha ghǫ nàdageètı̀, łagoı̨̀deh-le hadı. Achı̨ done ehde haà-le dıı eyıts’ǫ Yamǫǫ̀zha Nǫ̀gha kè zǫ yeehxà, eyıt’à dıı dzęę̀ k’e ts’ǫ̀ Nǫ̀gha gıke ı̨t’ǫ̀ą xè nekoò. Eyıı̀ haanı t’a, Yamǫǫ̀zha Hodoòdzoo achı̨ done gha nezı̨ ayıı̨̀la. Dıı dzęę̀ gots’ǫ̀ Tłı̨chǫ goòt’ı̨ Hodoòdzoo k’e hodoògedzoo nındè, ı̨daa edàanı̀ gıxè hoòɂǫ ha gık’ezhǫ gedı. Ehkw’ı hodageèdzoo nındè, ı̨daa wha gots’ǫ̀ hotı nezı̨ gıxè hoòɂǫ xè whaa gots’ǫ̀ egenda ha gedı. Gamètı̀ gots’ǫ Harry Sımpson wegondı ghaà àtł’è. 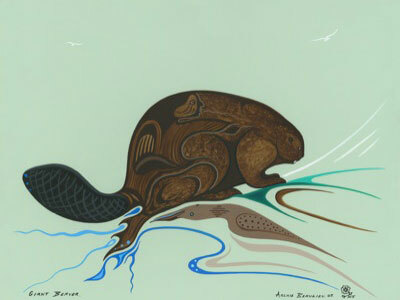 Long ago, a giant beaver built a big dam at the mouth of the Yellowknife River, blocking the flow into Great Slave Lake. When people canoed nearby, the beaver tipped their canoes and drowned them. Yamǫǫ̀zha was a very powerful medicine man who came to help the people. 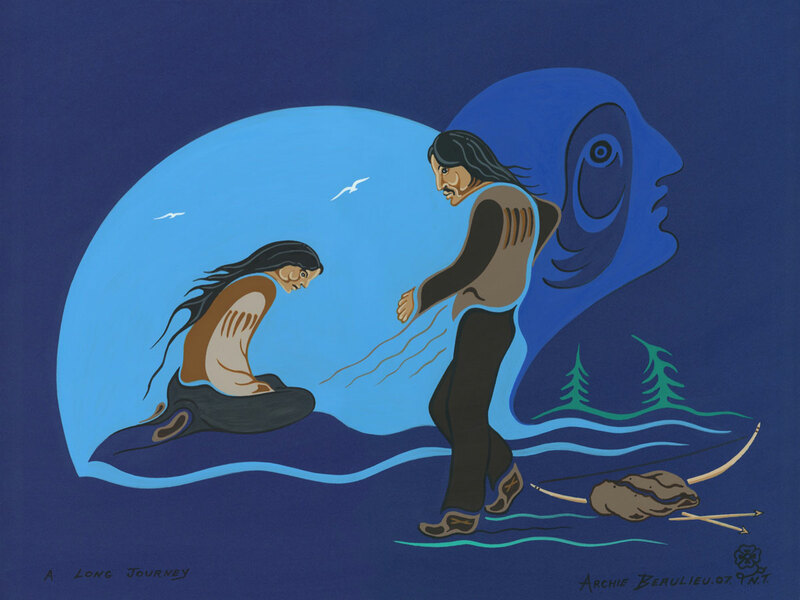 The Yellowknives Dene told him of the trouble the giant beaver was causing. Yamǫǫ̀zha decided to investigate. At the mouth of the Yellowknife River, Yamǫǫ̀zha found a massive beaver lodge. 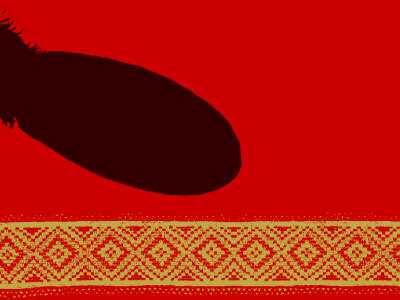 He took his huge shovel with a scoop made of woven babiche and stuck it into the lodge to open it. He found a giant beaver living inside. 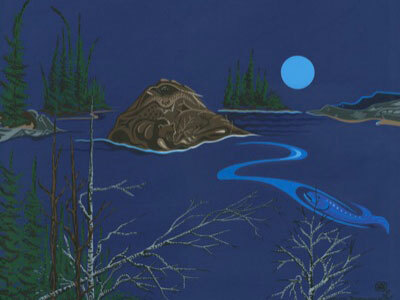 Quickly, the beaver pushed his lodge to one side and swam into Great Slave Lake to escape. This freed the flow of the river into the lake. The people could travel and fish there safely again. 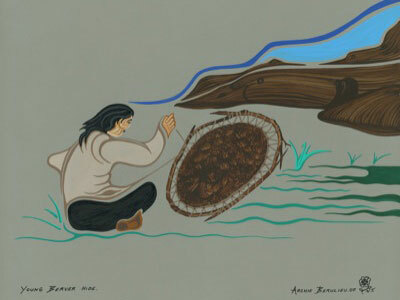 The beaver’s lodge turned to stone and became a point, called Kwekaàts’òa. 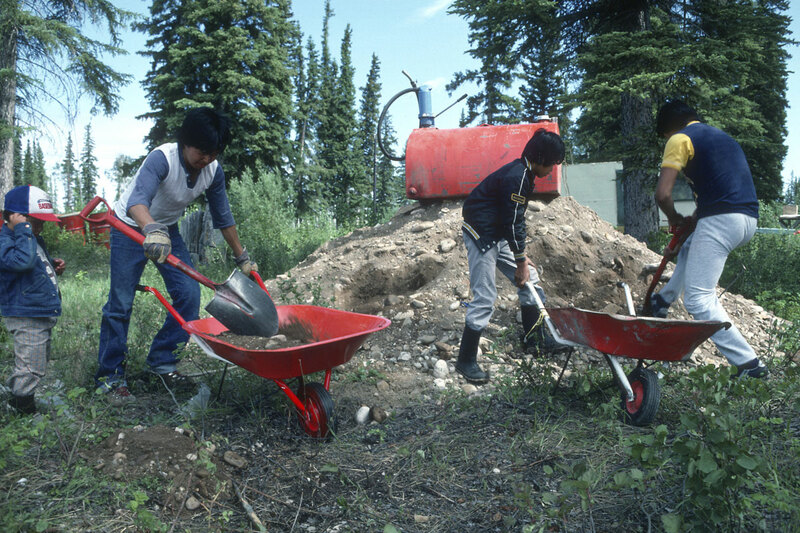 Yamǫǫ̀zha’s shovel still exists as a large spruce tree on the point, known as Ts’iwhacho. To this day, people pay their respects to Kwekaàts’òa and Ts’iwhacho when traveling in the area. Adapted from Grade Four Social Studies Curriculum, as told by the Yellowknives Dene. Akwewhaà, Wıı̀lıdeeche tsàcho tsàkę̀ę̀ necha whehtsı̨, wet’à Tı̨ndee ts’ǫ̀ tı etł’ı haàdı̀. Done k’ıɂelà t’à akǫ wegaà nàgèakı̨ dè tsà goɂelà nełeyehtł’ı̀ t’à done tı t’à łahdè. Yamǫǫ̀zha weɂı̨k’ǫǫ̀ nàtso t’à done ts’àdı ha akǫ nıı̀tła. Wıı̀lıdeè goòt’ı̨ dıı Yamǫǫ̀zha ts’ǫ̀ dıı hagedı, tsàcho ats’ǫ gok’adawò gedı t’à Yamǫǫ̀zha akǫ gok’atah ha akǫ̀ ts’ǫ̀ɂetłah. Wıı̀lıdeèche, Yamǫǫ̀zha tsàkę̀ę̀cho yı̨ı̨̀gǫhɂǫ. Wets’ǫ ehtł’èkàgoò necha tł’ıhgǫǫ̀ t’à, hayeèzǫ. Tsàcho goyı̀ı nàde nǫ. Įwhąąt’ı, tsàcho tsàkę̀ę̀ yeɂǫ̀ǫ̀ ts’ǫ̀ ayı̨ı̨̀la t’à Tı̨ndee ts’òemı̨. Wet’à tı Tı̨ndee ts’ǫ̀ haı̨̀lı̨ ajà. Achı̨ done akǫ łıwe k’agede ha esąnı̨le ajà. Tsàkę̀ę̀ kwe whelı̨ eyıts’ǫ ehdaà elı̨ ajà, Kwekaàts’òa wıı̀yeh ajà. Yamǫǫ̀zha wets’ǫ ehtł’èkàgoò ts’ı wegaà ehdaà necha whelı̨, Ts’ıwhacho wıı̀yeh ajà. Dıı dzęę̀ gots’ǫ̀ done Kwekaàts’òa eyıts’ǫ Ts’ıwhacho gaà aget’ı̨ nındè ndè ts’agehdı̀. Wıı̀ledeh goèt’ı̨ dıı gondı gehtsı̨, eyıts’ǫ edàanı̀ done kǫ̀ta nàgedè weghǫ chekoa nı̨htł’è dı̨ agehɂı̨ nàgı̨̀tł’è. Long ago, three giant beavers lived on Lake Athabasca. They made life difficult by building huge dams and flapping their tails to drown people. A giant man named Hachoghe decided to help the people by getting rid of the giant beavers. 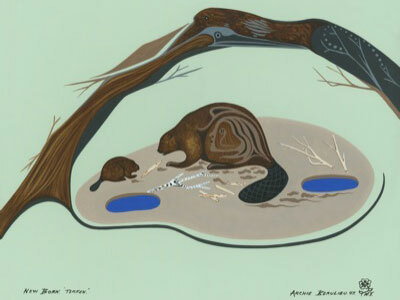 The first beaver made his den on the west side of the Lake Athabasca, near Old Fort. Hachoghe dug into the beaver’s den and killed it. 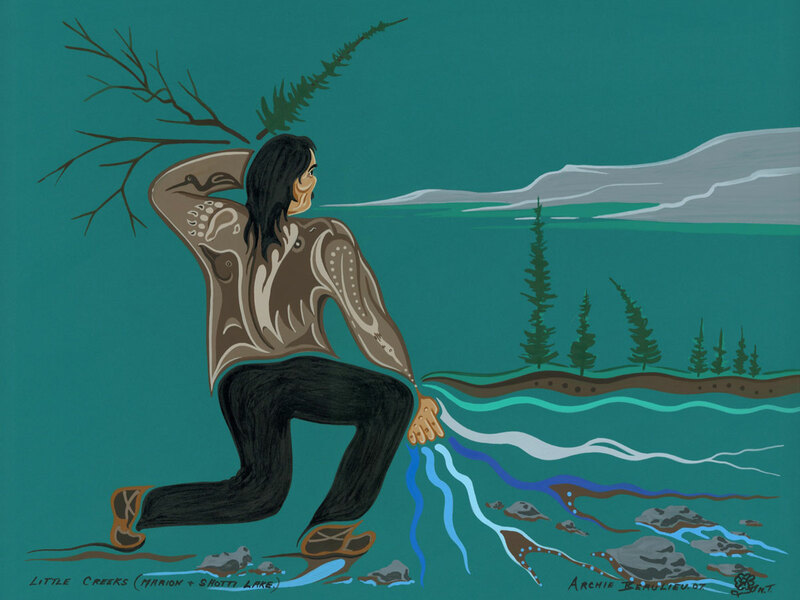 He tossed half the den into the Athabasca River, creating an island called T’anu. The second beaver swam to the south side of Lake Athabasca before Hachoghe caught up with him. 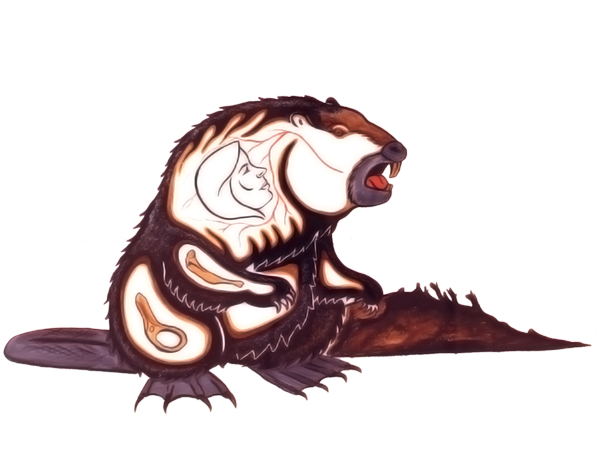 Hachoghe fought with the beaver and in their struggle, the beaver kicked away all the trees, creating the Athabasca Sand Dunes. After a long fight, Hachoghe killed the second beaver. The sand dunes are still red from the second beaver’s blood. The third beaver saw Hachoghe coming for him so he escaped down the Slave River. Hachoghe chased him all the way to Fort Smith and followed him over a beaver dam. This created the Slave River Rapids between Fort Fitzgerald and Fort Smith. Hachoghe continued to chase the third beaver north up the Slave River to the Mackenzie River. He finally caught up with him at Wolverine Rock, north of Tulita. There he killed the beaver and made a fire to cook it. Fat from the giant beaver dripped into the fire, igniting a flame that is still smoking today. Adapted from a story told by Victoria Mercredi of Fort Dënesųłıné, Alberta. Ɂatthe yunı̨́zı̨ ttháá, taghe tsácho Athabasca Túé k’e náde. Dáts’ena sı́ bet’á hunı́la, bets’ı̨ tsákı̨́ cho dághą-ú tth’ı beché t’á tu dálxál t’á dëne tu dánı́ldel. Ɂedırı dëne nechá cho, Hachoghe húlye dëne ts’úsnı́ yı̨dhı̨ t’á ɂeyı tsácho benë́né nánı̨la. T’atthe tsá ɂeyër Athabasca Túé k’e nas ts’ë́n xaɂa tsákı̨́ hełtsı̨, ɂeyı Old Fort húlye ghá nı́dhı́le. Hachoghe ɂeyı tsácho bets’ı̨ tsákı̨́ yérelnı́-ú ɂeyı tsá łeghąı̨́łdhër. Ɂeyı tsákı̨́ danızı̨́ Athabasca deze yé yıłchë́l, bets’ı̨ ɂë́ne nu T’anu húlye ɂųlı ɂája. Ɂeyı ɂı̨lághe tsácho Hachoghe hı́łchú tthe yuyághe Athabasca deze ts’ë́n héhbı̨. Hachoghe ɂeyı tsácho k’ádhër ts’ı̨ ɂë́né, ɂeyı tsá harelyú dechëne yuwénıłɂëth t’á Chocheɂerelche hųlı ɂája. Tháá ɂełk’enáı́ddhër tł’ághe Hachoghe ɂeyı tsácho łegháı̨́dhër. Ɂeyı tthaye Chocheɂerelche ghá ɂałų́ tsá dële t’a delk’os. Ɂeyı nade tsácho sı́ Hachoghe hegal ɂeyı̨ t’á yuyaghé Des Nedhé ts’ë́n tthę́cha. Hachoghe Tthebacha ts’ë́n néyenı́yú yek’ı́nı tsáɂél dedhe yę́yú. Ɂeyı ts’ı̨ ɂë́ne ɂeyëre Tthebatthı ts’ı̨ Ttthebacha ts’ë́n theba hųlı ɂája. Hachoghe ɂeyı nade tsácho t’at’u yeneyule xat’éé yudaghé Des Nedhé ts’ı̨ yudaghé Descho ts’ë́n yenéyú. Ɂeyı Naghaye Tthe húlye Tulıt’a ts’ı̨ yudaghé ts’ë́n haɂa ɂeyëre t’a yeghá nı́ya. Ɂeyër t’a tsácho łegháı̨́łdhër-u kón délk’ą yełt’ëth xa. Tsácho tłezé kón k’e deltł’ul ts’ı̨ ɂë́né dék’a, ɂeyı kón dek’ën ɂałų́ dų́rıdzı̨ne ts’ë́n búret’ı̨ ɂat’e. Vıctorıa Mercredı K’áı́tel Kų́é, Alberta k’éyaghe ts’ı̨ dënexél halnı ɂat’e. Giant Beavers were as big as bears! The giant beaver (Castoroides Ohioensis) was abundant in parts of North America during the last Ice Age (the Pleistocene). It was the size of a black bear and could weigh up to 200 kilograms. Giant beaver fossils have been found in the Yukon’s Old Crow Basin, 150 kilometers north of the Arctic Circle. These fossils are between 60 000 and 130 000 years old. Scientists state that the giant beaver became extinct during the last Ice Age, 10 000 years ago. Dene stories say there are a few giant beaver, called Tsacho, still alive in the NWT. 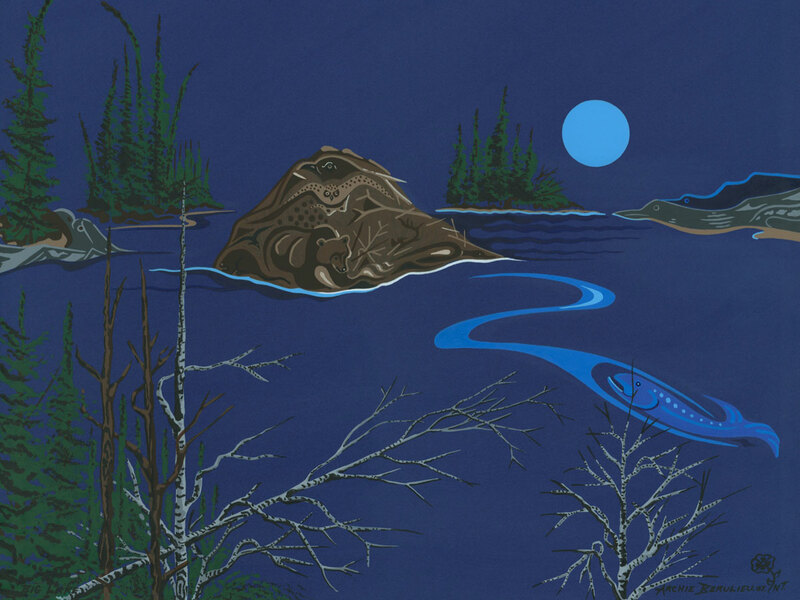 Background: Giant Beaver Pond by George “Rinaldino” Teichmann. These colourful paintings by Archie Beaulieu narrate the story of Yamǫǫ̀zha and His Beaver Wife for a children’s book. They were commissioned by the Yellowknife Catholic Schools through funding from the Government of the Northwest Territories and the Department of Canadian Heritage. The story is based on a Tłı̨chǫ legend told by Vital Thomas to anthropologist June Helm in 1966. Archie was born in the community of Behchokǫ̀ in 1952, where he lives with his wife Rose and their five children. Dıı nı̨htł’è chekoa gha nı̨htł’ètıı̀ wek’èch’àot’ı̨ t’à Yamǫǫ̀zha eyıts’ǫ wets’ekè tsà wegondı weghǫ Archie Beaulieu yı̨ı̨̀tł’è hǫt’e. 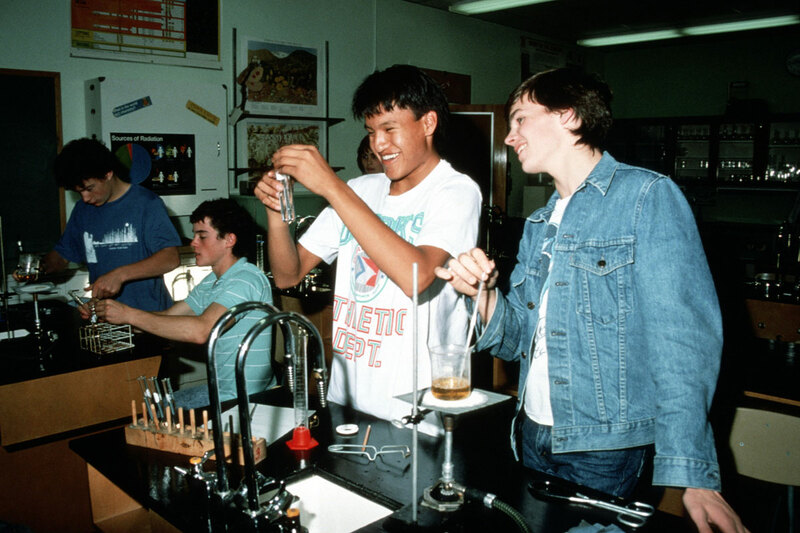 Yellowknife Catholic School yenı̨ı̨̀htł’è xè Edzanèk’e gots’ǫ Ndèts’ǫ̀ K’aòwo eyıts’ǫ Canadian Heritage sǫǫ̀mba t’à gots’àgı̨̀ndı. Dıı whaèdǫ gondı Vital Thomas 1966 k’e June Helm done yats’ı̨lı̨ wenaòwo k’ezhǫdǫdee elı̨ ts’ǫ̀ yatı yıghàı̨̀ɂǫ. 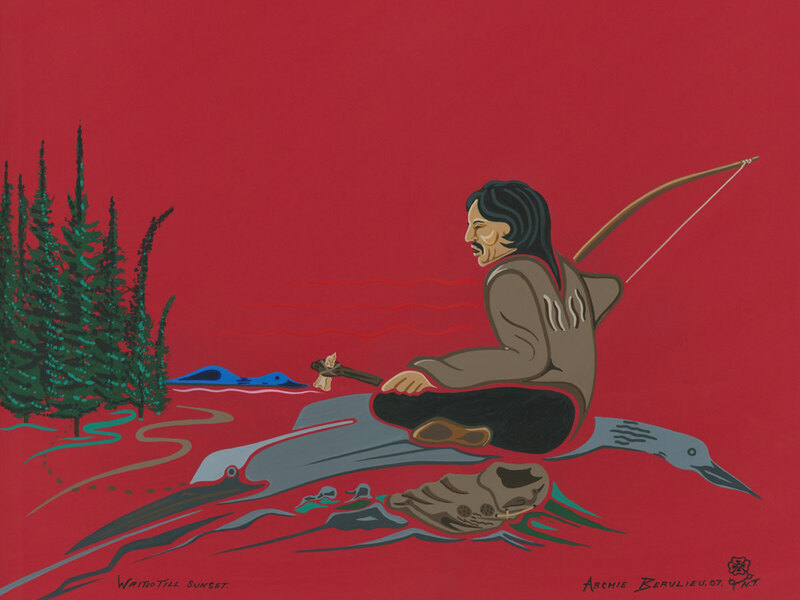 Archie 1952 Behchokǫ̀ dǫelı̨, akǫ wets’èke Rose eyıts’ǫ wekęę̀ sılaı xè nàdè. 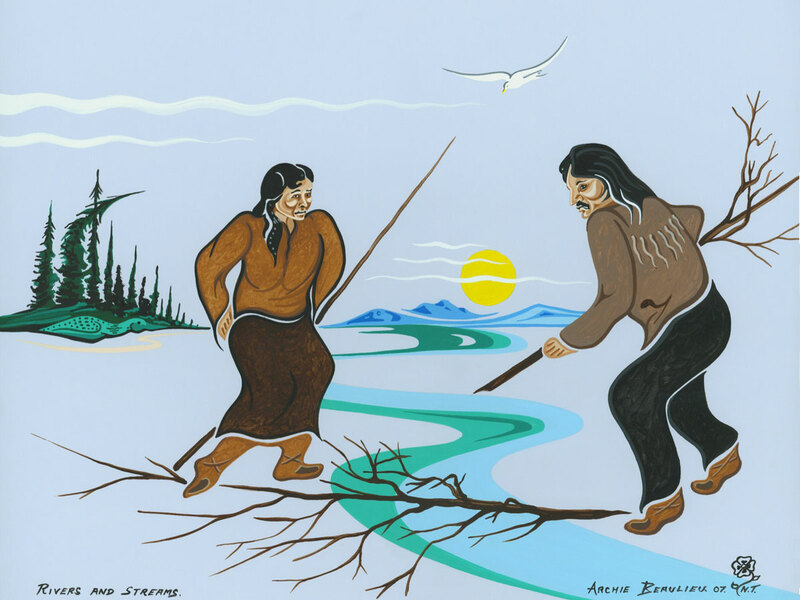 A long time ago, before Dogrib country looked as it does today, there lived two brothers, Sazea (Little Bear) and Yamǫǫ̀zha (Walks Around the World). In childhood, the two brothers played many superhuman but cruel tricks on their fellows. Eventually, Sazea went down to the Arctic coast. 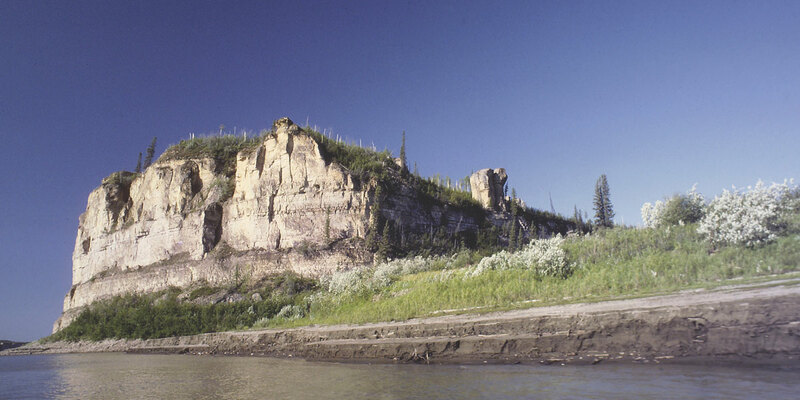 Yamǫǫ̀zha remained in the bush country of the Mackenzie River drainage, creating many of the natural features of the region. Akwee whaà Tłı̨chǫ gınè dıı dzęę̀ lagǫ̀ht’e-le, ełechı nàke gǫ̀hłı̨ ı̨lè. Įłè Sazea wı̀yeh eyıts’ǫ ı̨łè Yamǫǫ̀zha wı̀yeh. Eyı ełechıke gıgodıı̀ łǫ hǫt’e. Chekoa gı̨ı̨lı̨ı̨̀ ekò dǫ ts’ǫ̀ ts’àhogehtsı̨ t’à dǫ gha hoı̀la hogehtsı̨ ı̨lè. Nǫdèa ı̨̀łak’aà agejà. Sazea sı̀ı ı̨daà yabahtı̀ ts’ǫ̀ ajà. Yamǫǫ̀zha t’aa Dehcho nèk’e nàı̨dè, ekǫ nèk’e dànı̀ ndè gògat’ı̨ı̨ sı̀ı ededı̨ ayı̨̀ı̨̀là hǫt’e. Il y a bien longtemps, avant que le pays des Dogribs ne ressemble à ce qu'il est aujourd'hui, deux frères vivaient ensemble, Sazea (Petit ours) et Yamozha (qui marche autour du monde). Pendant leur enfance, les deux frères jouent de nombreux tours surhumains, mais cruels à leurs semblables. Sazea finit par se rendre vers la côte de l’Arctique, tandis que Yamozha reste dans la toundra autour du delta du fleuve Mackenzie créant un grand nombre de particularités naturelles de la région. After Sazea left, Yamǫǫ̀zha was very lonely. To take his mind off his brother, he walked for many days. As he was walking, he came to a girl who was all alone. She had lost all of her family and was now alone. Yamǫǫ̀zha asked her to marry him. Sazea naèhtła tł’axǫǫ̀ Yamǫǫ̀zha wegha gots’eèdı. Edechı k’è nıwǫ haa-le t’à edlaàtłǫ dzęę̀ ts’ǫ̀ k’eda, k’eda. K’eda ekò t’eeko whatsǫ wheda yeghaetła. Wèot’ı̨ hazǫǫ̀ ełàgı̨ı̨dè t’à dǫ wı̨ızı̀ı yexè eda-le. Eyıt’à Yamǫǫ̀zha ts’èko ts’ǫ̀ hadı, “Sexè nàądè,” yèhdı. Après le départ de Sazea, Yamozha se sent très seul. Afin de ne pas penser à son frère, il marche pendant de nombreux jours, jusqu’à ce qu'il rencontre une jeune fille qui était toute seule. Elle avait perdu toute sa famille. Yamozha lui demande de l'épouser. Ts’èko, “Hęɂę,” yèhdı, hanı̀kò Yamǫǫ̀zha yatı ı̨łè k’èdı̀ ha, yèhdı. Wekè nahtsoò ade hǫǫlı̨ haa-le. “Tł’otı̀a ta nàı̨tà haa-le eyıts’ǫ dehtsoa weteı̨tła-le Ndè k’e tı whı̀le sı̀ı zǫ k’e anet’ı̨ ha,” ts’èko yèhdı. La jeune femme accepte la proposition, mais à la seule condition que Yamozha lui fasse une promesse: qu’elle ne se mouillerait jamais les pieds. « Ne marche jamais dans l'eau contenant des herbes et ne passe pas dans les petits ruisseaux. Reste dans les endroits secs. Yamǫǫ̀zha nàɂeèhdlò, (del) hadı, “Eyı yatı k’èhdı̀ ha t’asanı̀ nı̀ le ! Nekè nahtsoò Ade ghǫ nànınewo-le. Nezı̨ı̨̀ nek’èhdı ha ne,” ts’èko èhdı. In the beginning, Yamǫǫ̀zha kept his promise. The two walked for many years all across the country. Yamǫǫ̀zha took good care of his wife. When she was tired, they rested. When they came to rivers and streams, Yamǫǫ̀zha cut down trees and bridged them so his wife could cross. Akwea t’à, Yamǫǫ̀zha deyatıı̀ k’èdı. Edaàtłǫ xo tsǫ̀ eyı nèk’e, hazǫǫ̀ ts’ǫ̀ k’eget’à. Yamǫǫ̀zha nezı̨ı̨̀ edets’èkeè k’èedı̀. Ts’èko nı̀ı̨tsǫ nı̨dè nahogezı̀. Deh nı̨ı̨lı̨ hanı̀-le dè dehtsoa ghǫ nègedè nı̨dè Yamǫǫ̀zha ts’ı nàehka gà deh te whelaà ayehɂı̨, hanı̀-ı̨dè wets’èkeè deh te naetła ha dı̀ı̀-le. Au début, Yamozha tient parole. Pendant de nombreuses années, les deux se promènent partout au pays. Yamozha s'occupe très bien de sa femme. Aussitôt qu’elle se sent fatiguée, ils s’arrêtent pour se reposer. Quand ils arrivent devant des rivières ou des ruisseaux, Yamozha coupe des arbres pour construire des ponts afin que sa femme puisse traverser à pied. One day in late summer, they came to a tiny creek with only a small trickle of water. Yamǫǫ̀zha thought that his wife would be all right so he did not cut down a tree. “She can step over it without any problem,” he said to himself. Įłàà ı̨mbè k’e dehtsoa, ekı̀ı tı łǫǫ̀-le xàewı̀ı ghǫ nègı̨ı̨de. Yamǫǫ̀zha wets’èkeè t’asade ha nıı̀le nıwò, eyıt’à yegha ts’ı nàı̨hkà-le. “Tı łǫ nıı̀le t’à wegha t’asanı̀-le. Yeète nàet’è ha dı̀ı-le,” hanıwǫ. Un jour, en fin d’été, ils arrivent devant un très petit ruisseau avec un mince filet d’eau. Yamozha pense que cela ne posera guère de problème pour sa femme. Il ne coupe donc aucun arbre. Il se dit qu’elle pourra enjamber ce ruisseau sans aucune difficulté. Įdaà nıwà nàet’e t’à, tı te naèhtła, ı̨daàt’ıı̀ naèhtła. Yamǫǫ̀zha t’ası̀ı łǫ ghǫ nànıwo t’à wegha hòı̨ɂà-le. Nıwà dèhtła tł’àxǫǫ̀, wets’èkeè yek’è naetłe-le nǫǫ̀, nàyèhzhı̨̀. Įdè k’eet’ı̨̀ı̨ là tı̨lı k’e wegoèht’ı̨̀-le. “Eyı ts’èko dàjà ghǫ-t’e,” hanıwǫ. “Sek’è etłe ha wedanaehɂı̨ xò,” hanıwǫ. Yamǫǫ̀zha waited for a long time, but still his wife did not appear. At last, he began to feel uneasy and he began retracing his steps through the forest. Yamǫǫ̀zha whaà yedanaèhɂı̨ hanı̀kò, ı̨łaà wets’èkeè wegoèht’ı̨̀-le. Nodèa yeghǫ nànıwoò ajà, eyıt’à ek’èt’à dechı̨nı edek’è k’è naèhtła. Yamozha attend très longtemps, mais sa femme ne vient toujours pas. Il se sent de plus en plus mal à l’aise et décide de retracer ses pas à travers la forêt. When he reached the place where he had last seen his wife, he was astonished to find that the small trickle of water had turned into a big lake. In the middle of the lake was a big beaver house. Edı̨ı̨̀ node edets’èkeè eɂı̨ ghǫ nǫ̀ǫtła ekò eyı dehtsoa ı̨lèe sı̀ı wetł’àxǫǫ̀ tı nechàa whelı̨ nǫ t’à sıı̀ wegha enıı̀yah. Eyı tı tanı tsàkę̀ nechàa wheɂǫ nǫǫ̀. Quand il arrive à l’endroit où il avait vu sa femme la dernière fois, il est surpris de voir que le mince filet d’eau est devenu un vaste lac au centre duquel se trouve une immense hutte de castors. Tsàkę̀ weyı̀ı gots’ǫ tsà xàèhmı̨. Yamǫǫ̀zha yets’ǫ gode, “Sets’èke neeɂı̨ nı̀?” yèhdı. Tsà yets’ǫ̀ hadı, “Nets’èkeè aht’e ı̨lè. Hanı̀kò neyatıı̀ naądı̀-le ts’ıhɂǫ̀ sekè nahtsoò ajà. Nezı̨ı̨̀ sek’ènedı̀-le t’à tsà whıhlı̨ hǫt’e. K’achı̨ nek’è k’ehda ha dı̀ı̀,” Tsà yèhdı. Yamǫǫ̀zha became furious. “ My magic is powerful,” he answered the beaver, “I will catch you and turn you into a woman again.” He began to chase the beaver. Yamǫǫ̀zha sıı̀ ı̀ts’è t’à hadı, “Seɂı̨k’ǫǫ̀ nàtso hǫt’e Daneehchı gà k’achı̨ ts’èko nelı̨ı̨̀ anehłe ha ne.” Hadıı̀ t’a, tsà deèzhı̀. Yamozha devient furieux. « Je suis un magicien puissant », il répond au castor, et « je vais vous attraper et vous transformer en femme à nouveau ». Il commence à pourchasser le castor. When they came to Marian River, he lost her. He looked for her everywhere, digging into the bush. Around Shoti Lake today, there are all kinds of little creeks made when Yamǫǫ̀zha hopelessly dug in the earth. He did not find his beaver wife. K’aàgotı̀deè ts’ǫ̀ nègı̨ı̨de ekò Tsà yenaɂı̨̀èhtła. Hazǫǫ̀ ts’ǫ̀ yehak’eet’ı̨̀ t’à dechı̨nı ndè xàgoı̨hgè. Dıı dzęę̀ k’e ts’ǫ̀ Behcho Tı̀ wemǫǫ̀ dehtsoa łǫ nıɂà, eyı sı̀ı Yamǫǫ̀zha ndè xàgoı̨hgè hǫt’e. Hanı̀kò ı̨łaà edets’èkeè gòhɂǫ-le. En arrivant à la rivière Marion, il la perd. Il la cherche partout, creusant dans le bois. Autour du lac Shotti, aujourd’hui, il y a de très nombreux petits ruisseaux qui ont été créés quand Yamozha avait creusé dans la terre. Il ne la retrouve pas. 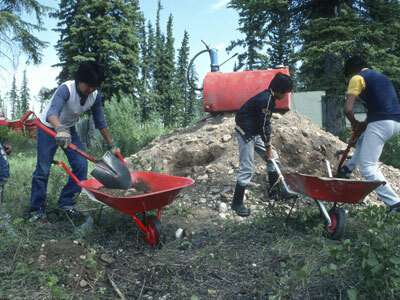 Yamǫǫ̀zha was tired from all of this work, but he kept on looking until he got to Marian Lake. Still, there was no sign of Beaver. Yamǫǫ̀zha needed to rest, so he sat down on Shiagu, a mountain on Murphy’s Point. On top of this mountain is a flat rock where Yamǫǫ̀zha sat when he looked for his wife. Yamǫǫ̀zha hòtł’ò eghàlaı̨da t’à nı̀ı̨tsǫ, hanı̀kò Įdak’ètı̀ ts’ǫ̀ ı̨łaà yehak’eet’ı̨̀. Tsà ı̨łaà wegoèht’ı̨̀-le. Yamǫǫ̀zha nahoedzhı̀ ha nıwǫ t’à Shıagoò ka datł’àhda. Eyı shı̀h ka kwe k’e datł’àı̨hda sı̀ı weka goı̨tłoa ekǫ wheɂǫ. Yamǫǫ̀zha yeka datł’àı̨hda gà edets’èke hak’eet’ı̨̀ ı̨lè. Tous ces efforts épuisent Yamozha mais il n'abandonne pas ses recherches jusqu'à ce qu'il arrive au Lac Marion. Là, il ne trouve aucun signe du castor .Yamozha a besoin de se reposer et il s’assoit sur le mont Shiagu qui domine la pointe Murphy. Au sommet du mont, il y a un grand rocher plat sur lequel Yamozha s'était assis quand il cherchait sa femme. As he sat on top of the mountain, Yamǫǫ̀zha listened carefully. He heard the sound of a beaver chewing somewhere near Nı̨shı̀ı or Old Fort Rae, which is on the North Arm of Great Slave Lake. Old Fort is on a long, long, point. That point is the dam Beaver was trying to make. Eyı shı̀h ka datł’àhda gà hotıı̀ eèhkw’ǫ. Yee Nıshı̀ ts’ǫ̀ tsà t’ası̀ı k’e gooɂà hǫt’e, hǫtł’ò agodı yeèhkw’ǫ. Nıshı̀kǫ̀ ehdaa nedèe k’e gòɂǫ hǫt’e. Eyı ehdaa sı̀ı Tsà ɂeɂè naàwhehgè hǫt’e. Įnòò dè k’e ts’ǫ̀ ɂeɂè nawheɂaà ayele ha hoę̀hdzà. Assis au sommet de la montagne, Yamozha écoute attentivement. Il entend le bruit d’un castor rongeant quelque part tout près de Neeshi, ou Vieux-Fort sur le bras Nord du Grand lac des Esclaves. Le Vieux-Fort se trouve sur une très longue pointe. Cette pointe est la digue que le castor s’efforçait de construire. Just before Yamǫǫ̀zha got there, Beaver saw him so she dove and hid. Yamǫǫ̀zha followed her around the south shore of Great Slave Lake right around to the west side. 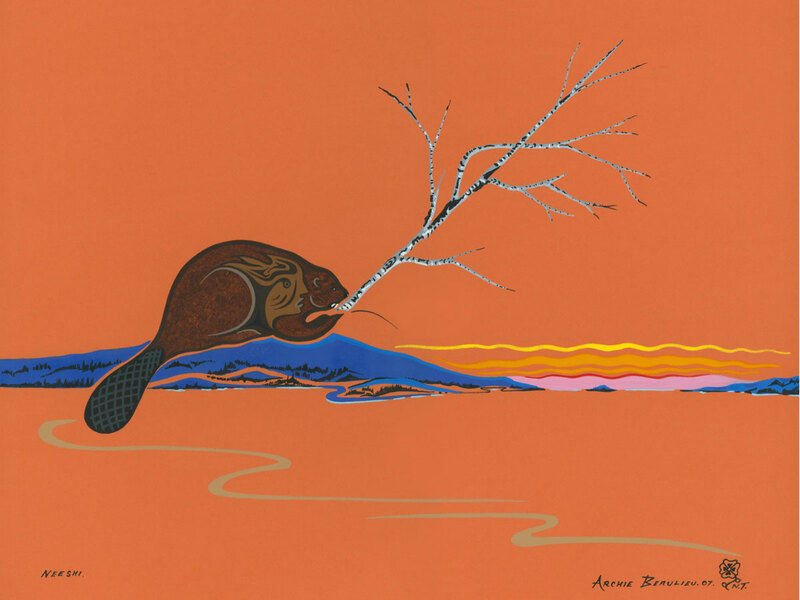 Finally he came to the end of a point which is called Tsà kǫ̀, “Beaver House”, where Beaver had made a house and had had a baby. Yamǫǫ̀zha eyı nı̀ı̀tła kwe-t’ıı̀ Tsà yaɂı̨ t’à tèhko, tèe nàdeeɂı̨̀. Yamǫǫ̀zha Tıdeè K’e, sazı̨ ts’ǫneè yekak’eet’ı̨ı̨̀ ajà, dą̀ą ts’ǫnèe ts’ǫ̀ yedeèzhı̀. Nǫdèa ehdaa welǫ Tsàkę̀ gòyeh ts’ǫ̀ nı̀ı̀tła. Ekǫ Tsà edekeę̀ gòhtsı̨, webebı̀a gǫ̀hłı̨. Juste avant qu'Yamozha arrive, le castor l’aperçoit et plonge pour se cacher. Yamozha la suit le long de la rive sud du Grand lac des Esclaves jusque vers le côté ouest. Finalement, il atteint l’extrémité de la pointe nommée Tsaken, la maison du castor, où le castor avait construit une hutte et accouché d’un petit. Yamǫǫ̀zha dug into the top of the beaver house. You can see the hill where he dug his hole. He took the baby and killed it. 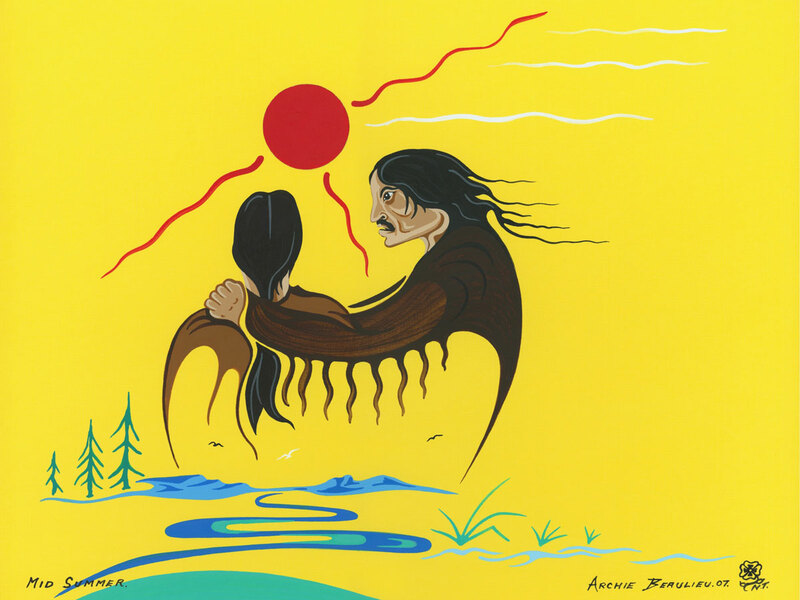 The mother fled down the Mackenzie River and Yamǫǫ̀zha followed her, carrying the baby’s body. Yamǫǫ̀zha tsàkę̀ weka xàgoı̨hgè. Shı̀hka edı̨ı̨̀ xàgoı̨hgè ı̨lèe sı̀ı dıı̀ ts’ǫ̀ wègaat’ı̨ hǫt’e. Tsàzea nıı̀chı̀ı gà ełayı̨̀ı̨hwho. 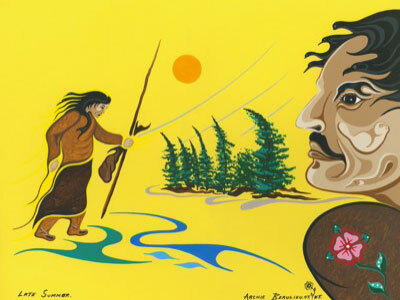 Wemǫ Dehcho k’è-et’ıı̀ naèhmı̨. Yamǫǫ̀zha tsàzeaweè k’ete xè yek’è-et’ıı̀ ajà. Yamozha creuse dans le haut de la hutte du castor. On peut encore voir aujourd'hui la colline où il a creusé son trou. Il saisit le bébé et le tue. La mère s'enfuit le long du fleuve Mackenzie et Yamozha la poursuit, portant le corps du petit. 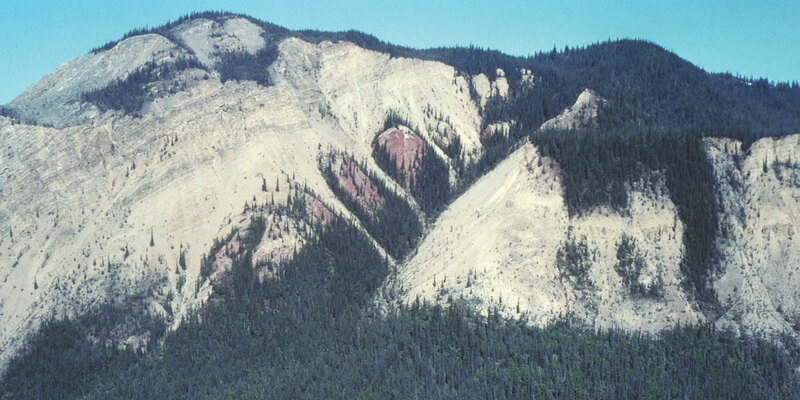 There is a burning place down the Mackenzie, the smoldering beds of lignite above Tulita or Fort Norman. 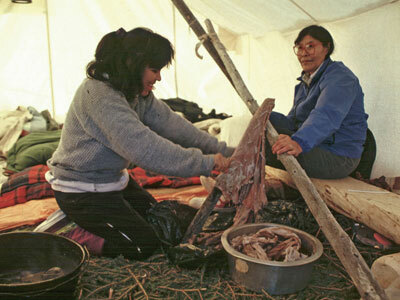 That’s where Yamǫǫ̀zha cooked the young beaver. As he was cooking, the beaver grease melted down and started to burn. And Yamǫǫ̀zha said, “This smoke will last forever.” You can see smoke there today, in the winter and in the summer. Dehcho gà ło xàı̨ɂà k’è gòɂǫ. Ekǫ Tıłı̀ht’a gà t’èè dèk’ǫ̀ k’è gòla. Ekǫ t’a Yamǫǫ̀zha tsàzea wheht’e. Tsàzea eht’è ekò wetłeè det’ee sı̀ı dèk’ǫ̀ ajà. Yamǫǫ̀zha hadı,” Welǫ whı̀le ts’ǫ̀ dıı ło xàı̨ła ha.” Eyıt’à dıı dzęę̀ k’èe ts’ǫ̀ xok’e eyıts’ǫ ı̨mbè k’e ło wègaat’ı̨ hǫt’e. Le long du Mackenzie, il y un endroit où couvent des feux dans les couches de lignites au-delà de Fort Norman. C'est l'endroit où Yamozha avait cuit le jeune castor. Pendant la cuisson, la graisse du castor fond et commence à brûler et Yamozha déclare que cette fumée durera une éternité. On peut voir la fumée aujourd'hui, en hiver et en été. 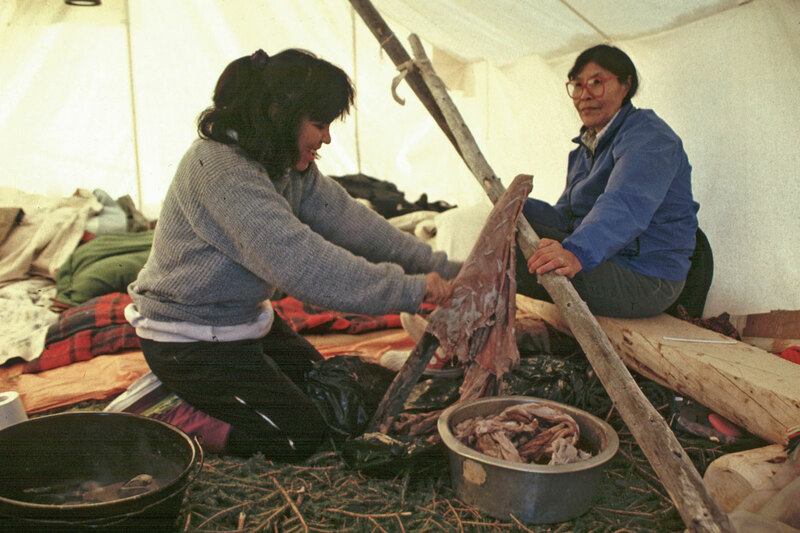 When Yamǫǫ̀zha finished eating, he walked further inland to stretch the hide on the ground. He carried large boulders and set them around the edge of it. In the Barren lands, behind Norman Wells there is flat land, in the shape of a beaver pelt. Yamǫǫ̀zha tsàzea ghǫ shèetı̨ tł’àxǫǫ̀, tsàzeawò dechı̨nı ndè k’e yehgǫ. Tsàzeawò wek’abàa kwe nechàa nèyı̨ı̨wa. Tłegǫ̀hłı̨ı̨ wet’aa hozı̀ı nèk’e ndè k’e goı̨tłoa gòɂǫ, tsàwò lanı̀ ets’aèhmǫ̀ą gòɂǫ. Quand Yamozha finit de manger, il s’en va plus profondément dans le bois pour étendre la peau au sol. Il transporte de très gros rochers qu’il place comme bornes autour de la peau. Dans la toundra, derrière Norman Wells, la terre est plate et en forme de peau de castor. Yamǫǫ̀zha was still angry at Beaver. He went back to her lodge, but she saw him coming so she swam down the big river. When she reached the Arctic Ocean, she kept going without coming back. Yamǫǫ̀zha was knew he would never catch her. He used his medicine power and turned her into an island. Yamǫǫ̀zha ı̨łaà Tsà ts’ǫ̀ wenı̀-le. Tsàkę̀ ts’ǫ̀ anajà hanı̀kò Tsà yaɂı̨ t’à Dehcho k’è naèhmı̨. Tsà Yabahtı̀ ts’ǫ̀ nı̀ı̀tła ekò ı̨dè k’eet’ı̨̀-le, ı̨daàt’ıı̀ naèhmı̨. Yamǫǫ̀zha hòt’a dayeechı haa-le yek’èezhǫ. Edeɂı̨ı̨̀k’ǫǫ̀ t’à, Tsà dı whelı̨ı̨̀ ayı̨̀ı̨̀là. Yamozha est toujours en colère contre le castor. Il retourne vers sa hutte, mais elle le voit venir et part en nageant dans le grand fleuve. Quand elle arrive dans l’océan Arctique, elle ne s’arrête pas et ne regarde pas en arrière. Yamozha comprend qu'il ne la rattrapera jamais. Il se sert de son pouvoir magique et la transforme en île. This birch bark canoe was made by Chief Jimmy Bruneau of Behchokǫ̀ in the early 1970s. 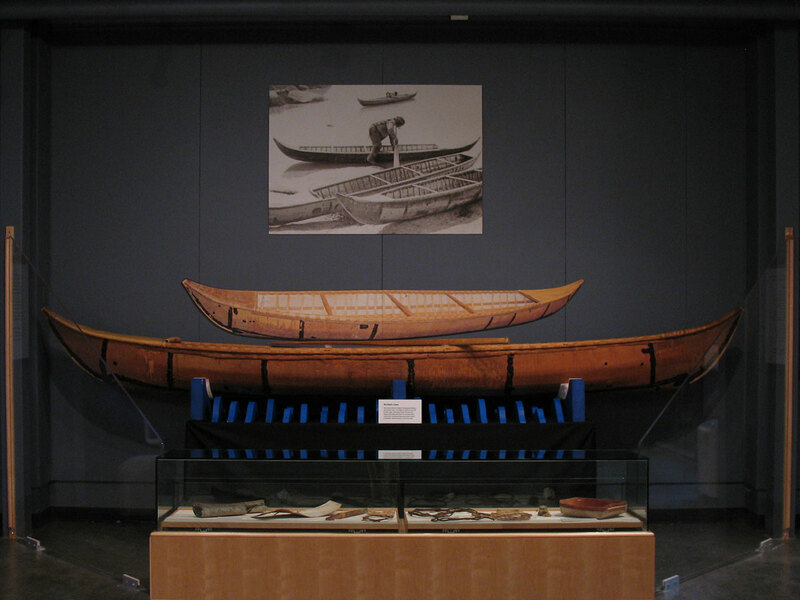 Dene stories describe Yamǫ́rıa traveling great distances by birch bark canoe. 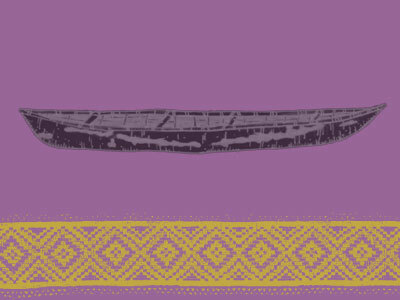 According to a Gwich’in story told by Tony Andre, Atachuukąįį dreamt the canoe into being. He fell asleep and dreamt of a wooden frame, a birch bark covering and sticky spruce gum to make it waterproof. When he awoke, a canoe was ready. Many Dene place names describe Yamǫ́rıa’s imprint on the land. They are reminders of this important cultural hero and the storied landscape inhabited by the people of Denendeh. The map below charts some of the places Yamǫ́rıa is believed to have visited on his journeys and describes what happened at these special sites. Please note that locations for many sites are approximate or have been obscured to protect cultural values. Click on the placemark pins to open the associated story. 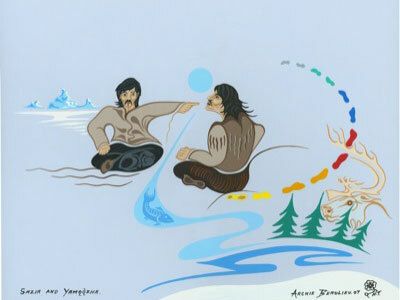 People say that when Yamǫ́rıa left Denendeh, he paddled to the Arctic Ocean. Some say that he disappeared entirely. Others say he is still out there, travelling around the world. 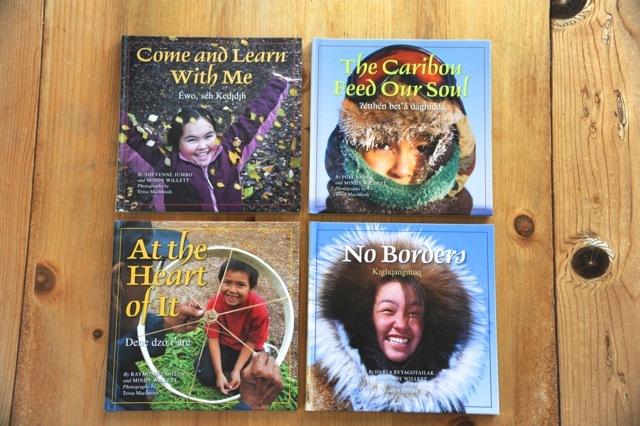 Many of the photos presented here can also be found in The Land Is Our Storybook series of books for children about the land and people of the Northwest Territories, as they exist today. Mindy Willett, an educator from Yellowknife, has written the stories of everyday life in accordance with stories told to her by storytellers, Elders, and cultural leaders from ten different regions in the territory. The books are illustrated by the striking images of northern photographer, Tessa Macintosh. 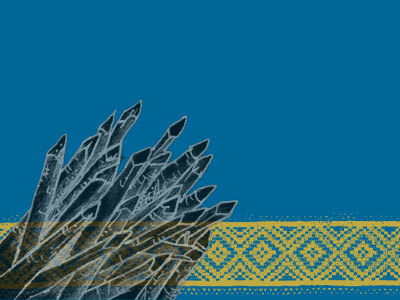 This website uses the latest web standards and a wide variety of multimedia tools to present the story of Yamǫ́rıa in an attractive format for all ages. Adapted from a HTML5/CSS3-compliant theme from Spiral Pixel, the website employs the Bootstrap web development framework for an interactive responsive experience suited to both desktop and mobile devices. A partial list of scripts and services are listed below. This website is typeset in DejaVu LGC Serif Condensed and Andika, two freely available unicode fonts capable of reliably rendering Dene orthography across OS platforms and browsers. See the orthography and font support page at the Prince of Wales Northern Heritage Centre website for further assistance with your own transcription projects.